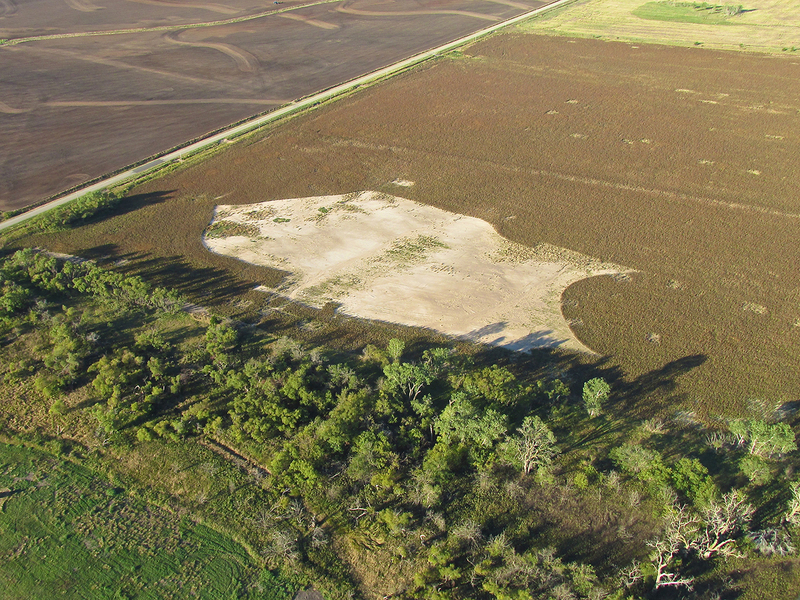 The more research I undertook prior to my flight to Attica, Kansas, the more interesting things were revealed. Initially, my interest in visiting the town began from a news story I had read. 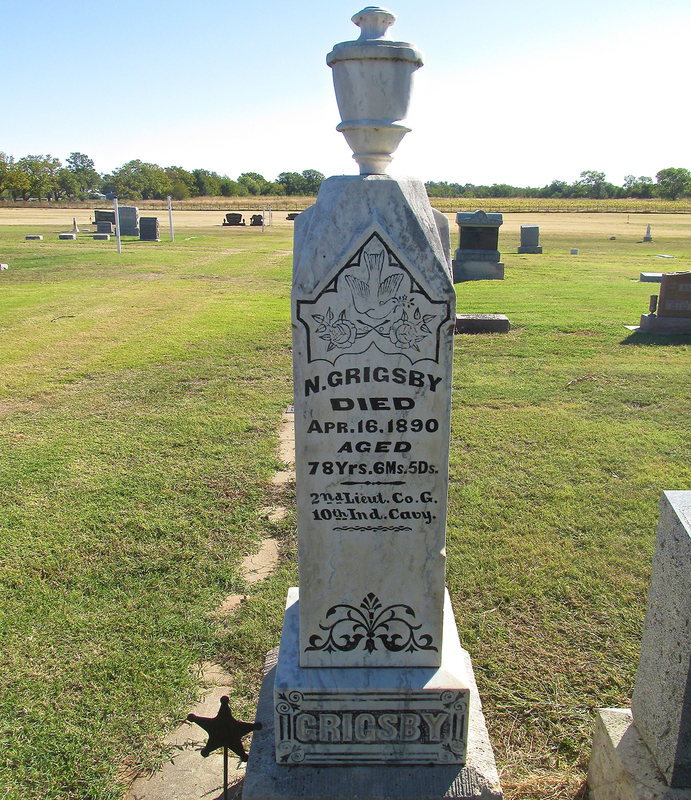 It told of a man named Nathaniel Grigsby who’s convictions regarding a particular political party were strong enough to have them engraved on his tombstone. I decided this was something I needed to see. Now, after my first visit to Attica, I am by no means an expert on it. But, after “scratching the surface”, I can tell you Attica enjoys a heritage encompassing many of the unique attributes typifying The Old West. But, in addition to that, it has the distinction of being home to the Top Flying Circus of the Barnstorming Era of the 1920’s. People tell me they like the pictures in these stories so I’ll get to them and cut the introduction now. Instead I’ll interleave more about my pre-flight research into the Attica Flight once I get airborne. Flying in an open cockpit has its benefits during what The Sky Surfer calls “The Fun Flying Season”. Here in Kansas, that is roughly March through October. Throughout that timespan the wind chill factor is mostly tolerable in street clothes although occasional early morning departures call for extra clothing. The temperature the morning of my flight to Attica was in the mid 30’s. Because it was slated to rise to the 60’s later in the day, I dressed light (Stage 1 Cold Weather) rather than going Stage 2 (Helmet, Sears Insulated Coveralls, Flight Jacket, Gauntlet Gloves, Neck Gaiter) or Stage 3 Cold Weather Outfit (Helmet, Flight Jacket, Windproof Snow Suit, Long Underwear, Electric Gloves, Double Neck Gaiter). The important update that allowed for this decision was the incorporation of what I call my Ninja or Spetsnaz mask (properly called a balaclava). I had never used it before and it worked excellently in combination with my large goggles to keep my head and face acceptably warm in the 40 mph wind. By the way, The NWS Wind Chill Chart declares a 35 degree day in a 40 mph wind to yield a 20 degree temperature effect on exposed skin. I have noticed an interesting visual effect for years… When flying in atmosphere that is particularly clear (depending on the reflectivity of the surface) you will see a “sunspot” on the ground. It appears at the end of an imaginary line drawn from the sun through your position in the sky to where it intersects the Earth’s surface. I’ll show some to you when I see them in this report. 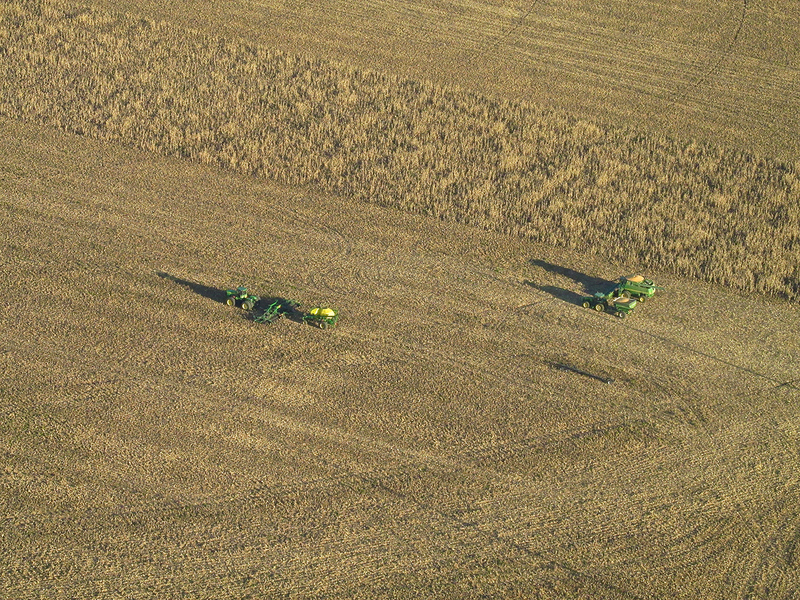 One minute after takeoff I see indications of a Corn Harvest. I’m at 600′ looking West Northwest. NOTE: The “Sunspot” in this photo is in the upper, left quadrant next to one of the ponds. HINT: All the long shadows point to it. Same as above with the telephoto lens. Perhaps the harvest crew previously shown will head here next. I like the patterns made by the terracing of the field. Hay Bales. Some farmers line them up real orderly; others let them drop where they may. 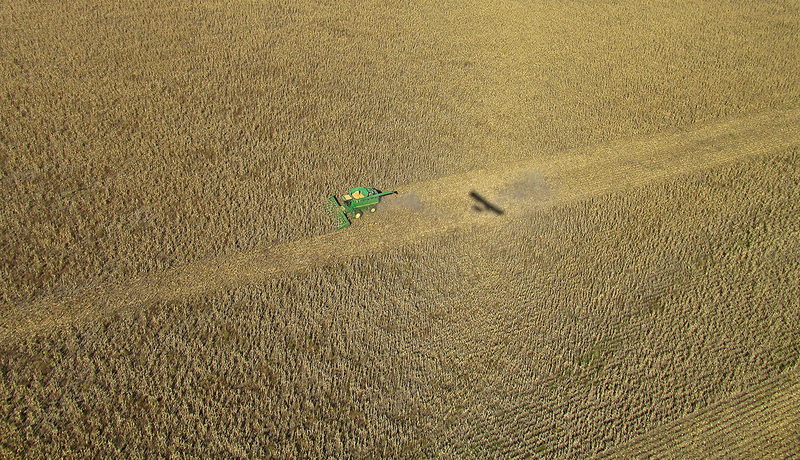 NOTE: The “Sunspot” in this shot is toward the right, under the curve in the field, next to the road. Research (what I sometimes call “Detective Work”) can be as mundane as calling 411 and asking for a telephone number. That simple step got me in touch with Gary Grigsby, the Great, Great, Grandson of Nathaniel Grigsby. Gary and his Wife Rogena are in the Real Estate business. Over the course of three different phone conversations, I determined that Gary was a veritable fount of historical information about Attica. During this time frame, I had mentioned to another good friend Bill Koelling, that I was planning a flight to Attica. 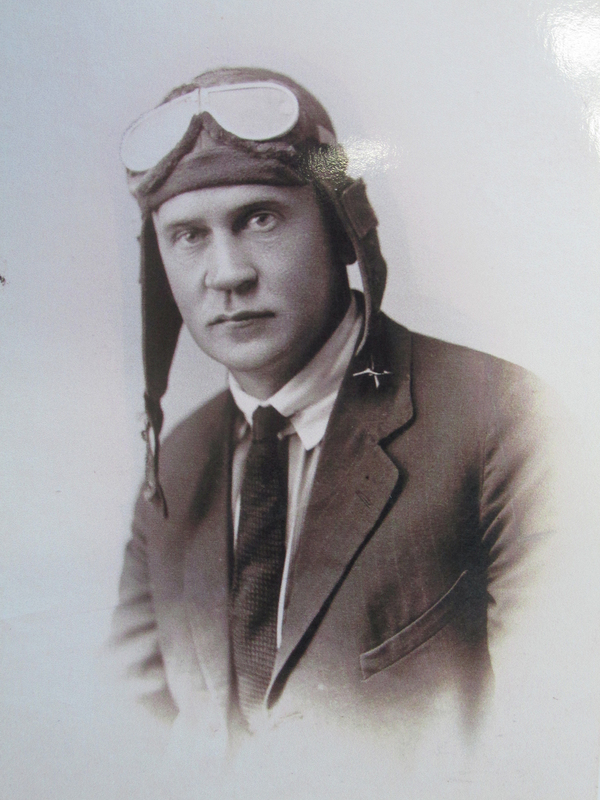 Bill also knew a lot about Attica and told me it figured large in early Aviation History. 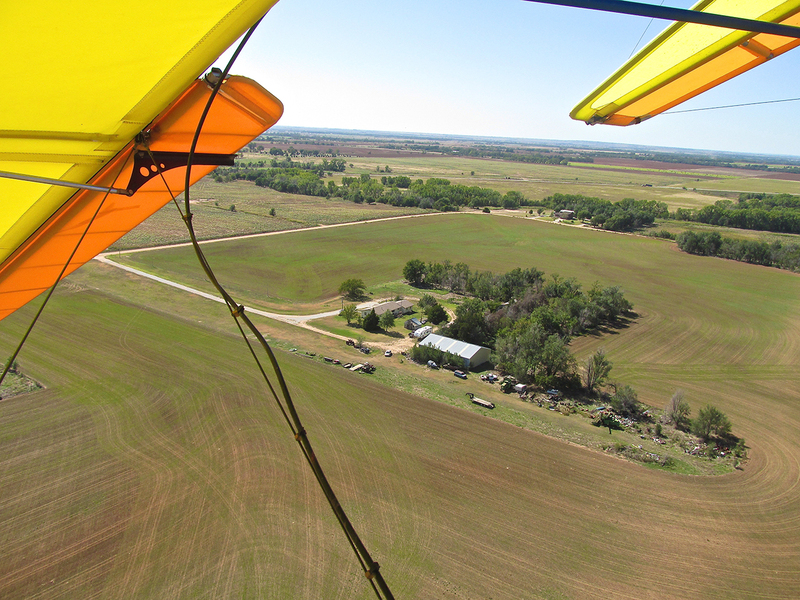 From him I learned that just South of town was Lone Tree Ranch, the home of Karl Garver’s Flying Circus. He sent me copies of a number of articles he had about The Circus from Popular Aviation Magazine and various newspapers of the time. Then, in an ensuing phone conversation with Gary Grigsby, I learned that his relation Leonard Grigsby still owns Lone Tree and flew a Cessna out of there for years. Leonard also has a lot of Garver Circus Memorabilia. 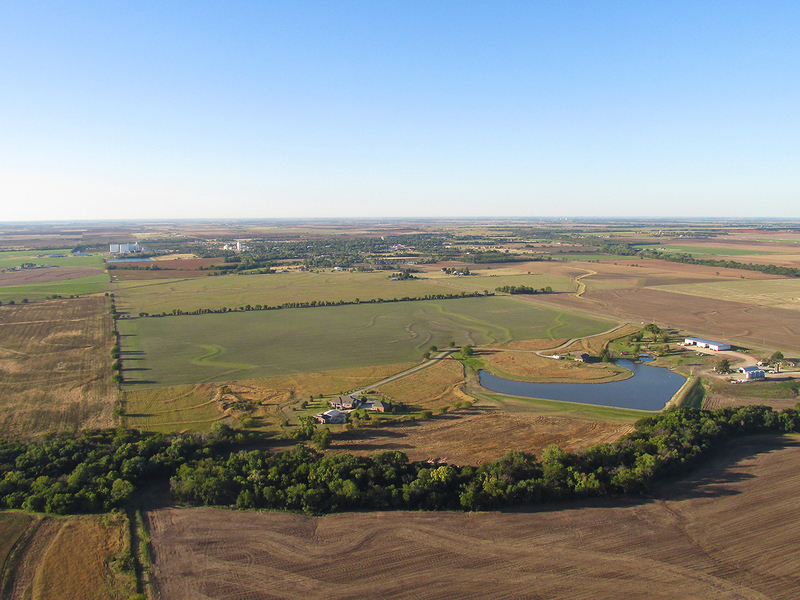 Conway Springs, Kansas from 600′ AGL looking South Southwest. I was intrigued by the way this field was planted in milo around the edges. I’m not sure what had been on the inside – maybe hay. Not being a farmer, I could be wrong but I see a dedicated, long-term effort to turn a salt wash into productive farm land – another bite each year. 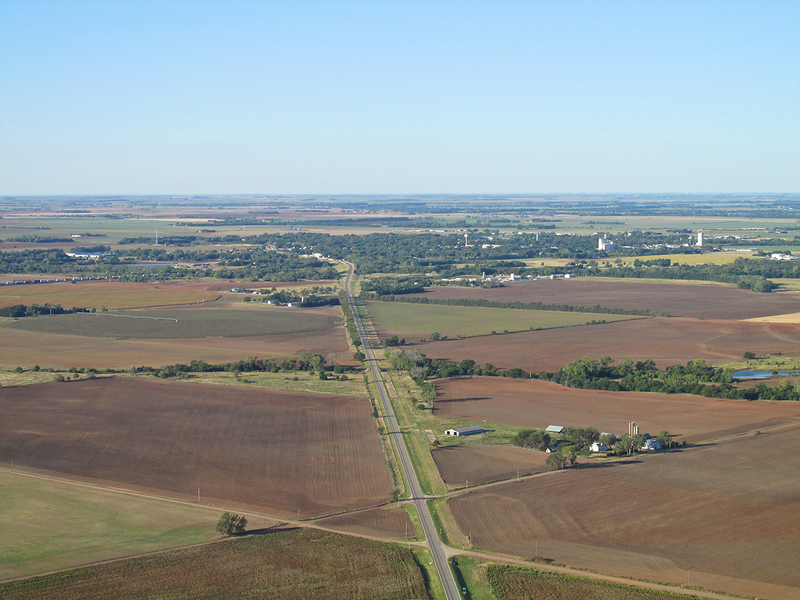 Still about 20 miles from Attica, I took this telephoto shot to show Harper, Kansas in the foreground in relation to Attica in the distance. I’m at 600′ AGL looking Southwest. When I first set my sights on Attica, I had to deal with the issue that it no longer has an airport. Google Earth still shows Goemann Strip on the Northwest corner of town but it had been inactivated for many years. Gary Grigsby verified this when I first talked to him. 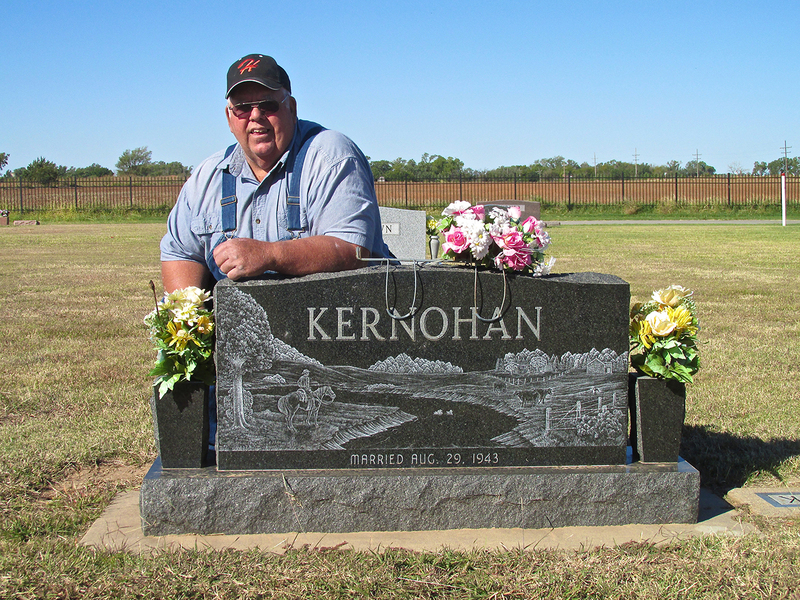 I learned that the Goemann Family no longer lives or farms on that land but that they rent it out to my Good Buddy Pat Kernohan and his Wife. I obtained Pat’s telephone number and explained my plan to visit Attica to see if I could land on the patch of land that had been the airstrip. Fortunately Pat was acquainted with the type of flying machine I have and knew how little space it needs to take off and land. He thought it would be no problem and was very interested in the whole thing. During our conversations, we found we concurred on a variety of subjects. Thus I refer to him as Good Buddy – a term of endearment not proffered lightly. So, I kept in contact with Pat. The day before the flight I called and said I was going to head over the next day. He said he was looking forward to it and volunteered to take me on a tour of the town and graveyard. On most of my trips, after I land – I walk – so I was very appreciative of this help. 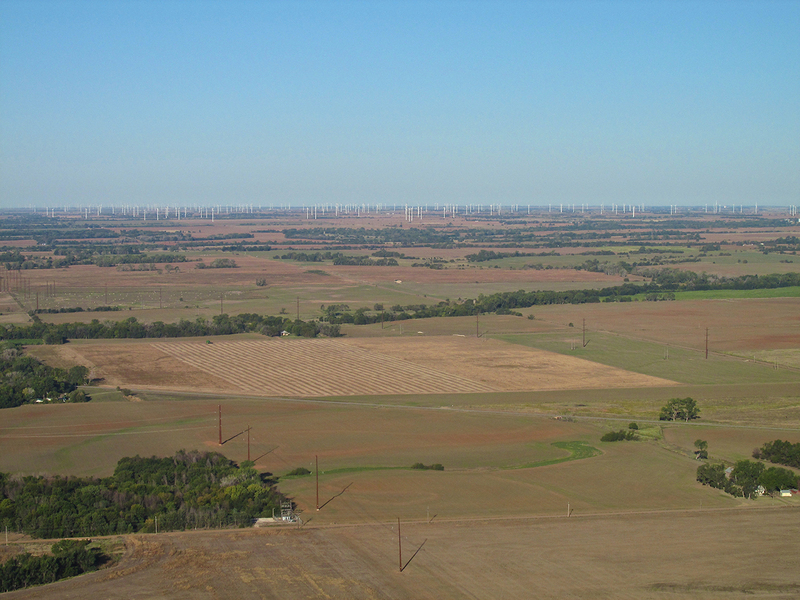 North of a line between Harper and Medicine Lodge, Kansas is a huge Wind Generation Field. 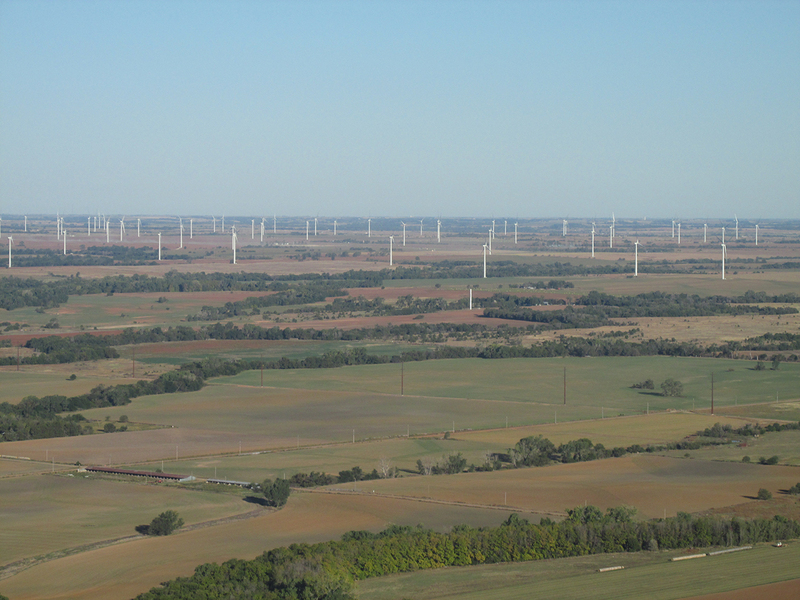 It is called Flat Ridge Wind Farm and is owned by British Petroleum. In a previous flight to Medicine Lodge, Kansas, I flew on the North side of this sprawling enterprise. 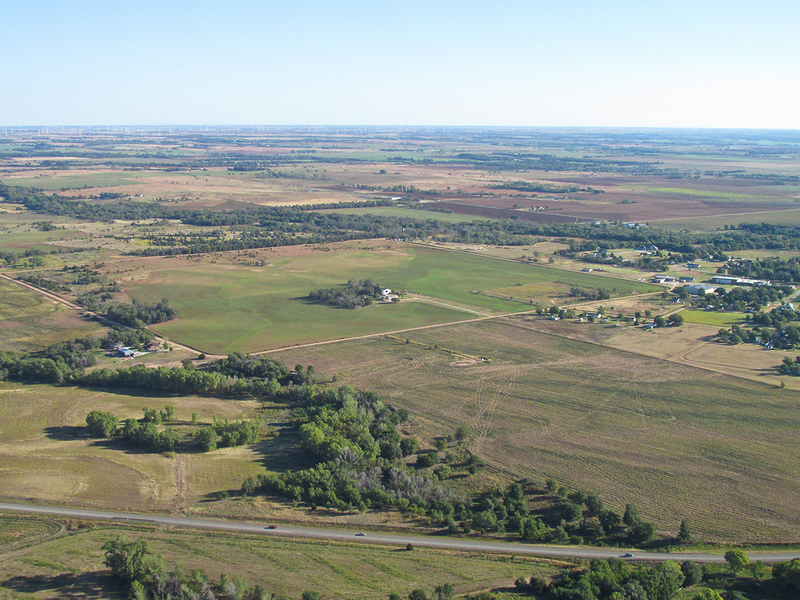 Above you can see it from a vantage point 5 miles Northeast of Harper, Kansas at about 500′ AGL looking East Northeast. It was not until reviewing the photos for this Attica story that I realized I have not “closed the loop” on my Harper Flight Adventure. I will do that during Flight Season 2014 (God willing…). 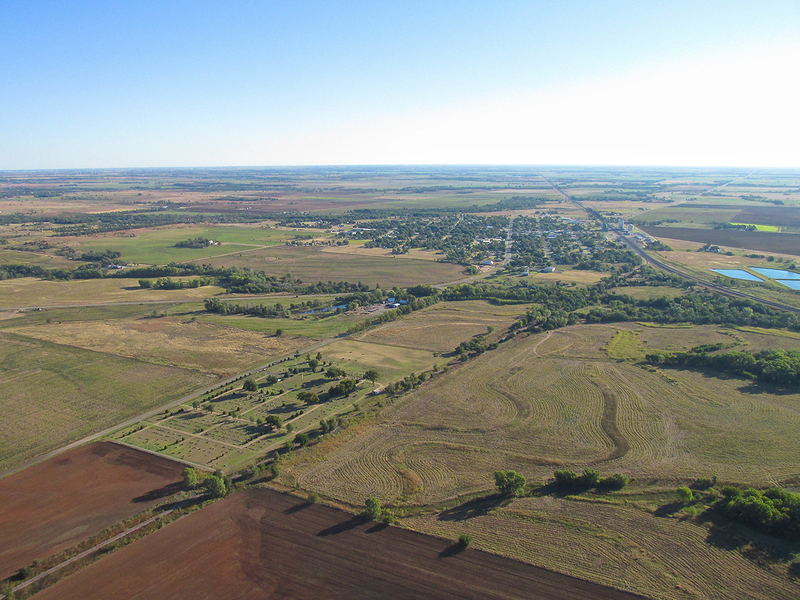 Harper, Kansas from 800′ AGL looking Southwest. Highway K2/US160 is in the foreground. 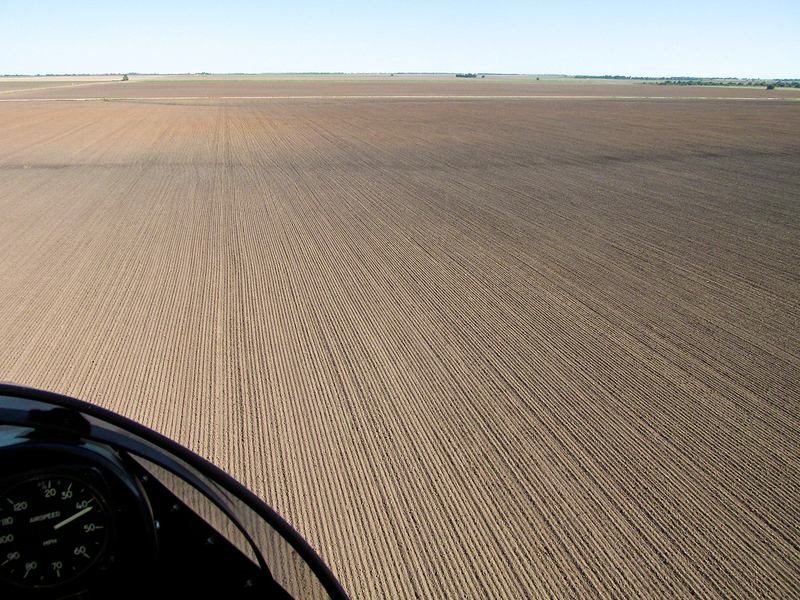 A Harper “pilot’s eye view” under my left wing looking due South. 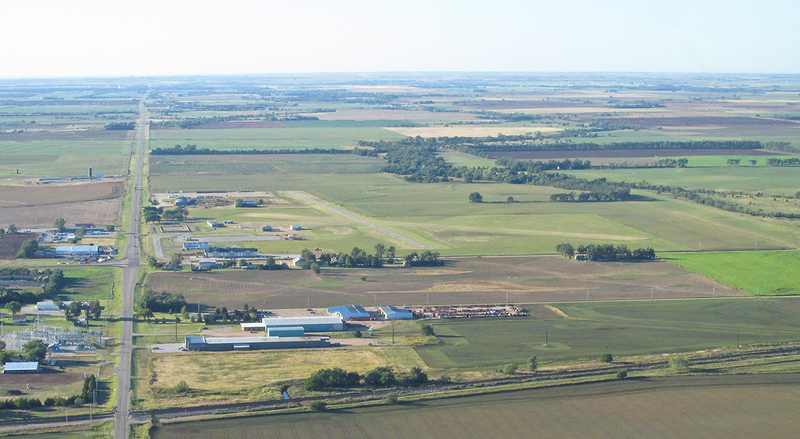 Harper Municipal Airport is on the Southwest corner of town. Another view of the wind farm. This was taken 5 miles Northeast of Attica at 400′ AGL looking Northwest. 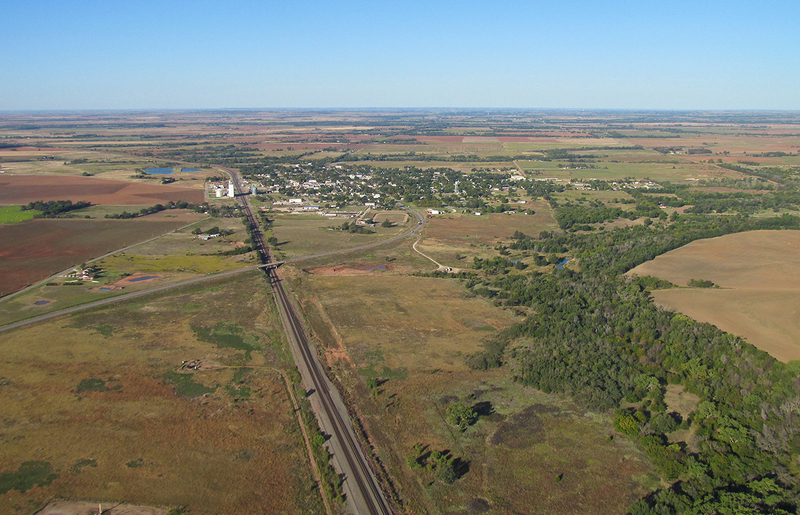 While railroads are still important today, from the middle to the end of the 19th Century, they were essential to the life of towns on The Great Plains. If a railroad moved its track, entire towns would dry up and disappear. In like manner, when a railroad set up track, towns would appear along side it. Attica is one such town. As if to buttress this point, an unusual aspect of Attica is that its streets are lined up with the railroad track. 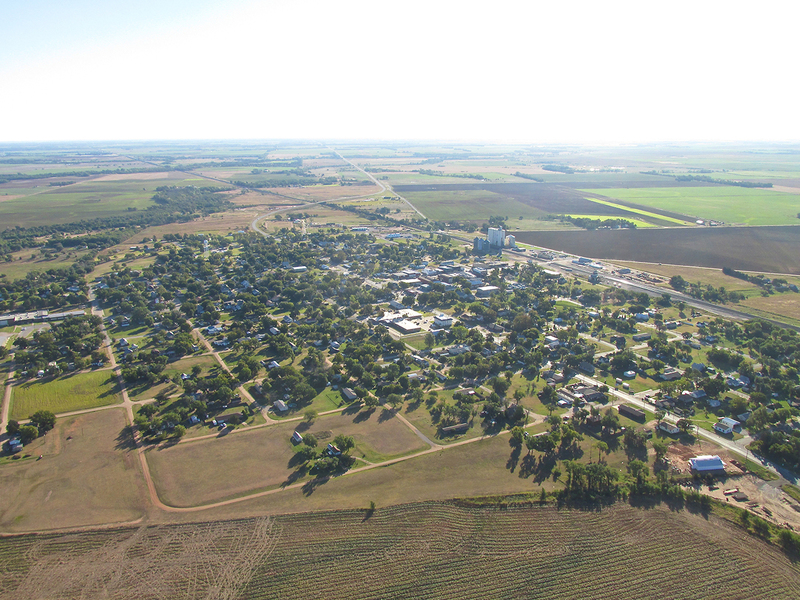 Nearly every other town in Kansas has streets in line with the compass. Coming next are a suite of Attica Aerials. Approaching Attica from the East with the BNSF Railroad Track passing through in the foreground. From this vantage point you can see the juxtaposition of the Town’s Streets compared with the East-West layout of the County Roads. 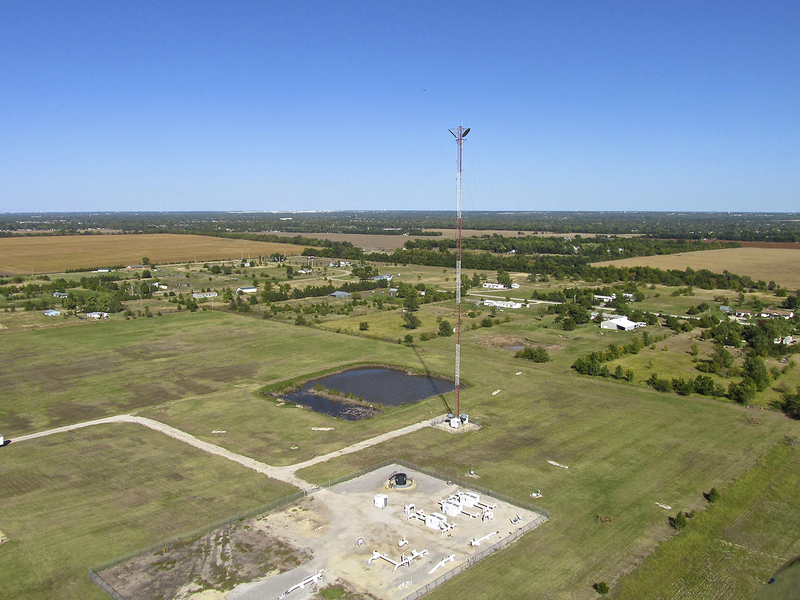 Attica from the Southeast at 900′ AGL. Wind Generators at the top right horizon. NOTE: There is a “Sunspot” in this photo centered on that white quonset hut just beneath dead center of the frame. A telephoto of the downtown district from the same position as above. I let the wind swing me West across the South end of town out past the cemetery so you could see them in proximity. This is from 900′ AGL looking East. 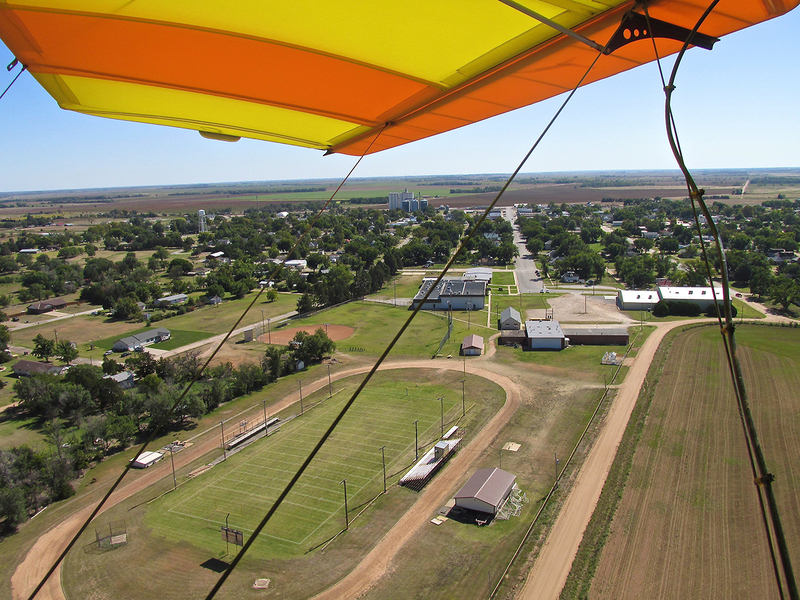 After whizzing downwind to the Southwest side of town, I turned 180 degrees back into the Northeast Wind. That’s when the Warp Speed Leg of the journey abruptly ended. I calculated the wind from the Northeast to be 30 to 33 mph at my altitude (900′ AGL). I had plenty of fuel so I bumped up the power setting. It’s not like throwing on the afterburner, though. The net result was an increase in ground speed from 7 mph to about 20. This gave me an inordinate amount of time to “enter the pattern” to Goemann Strip (aka The Kernohan Farm). Although it was pretty turbulent, I took about 20 pictures during that interval. Here are a couple of the better ones. 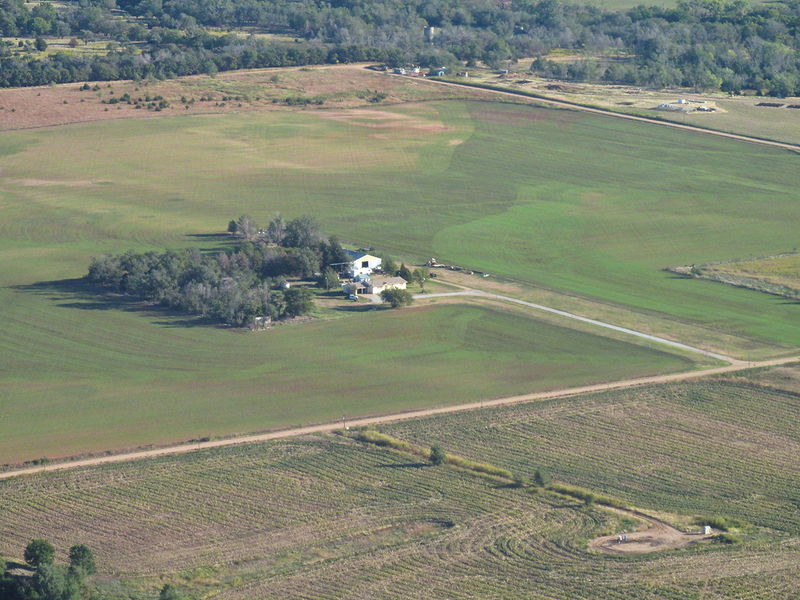 Pat and Cheryl Kernohan’s Farm where I will be landing. It is on the Northwest corner of Attica. 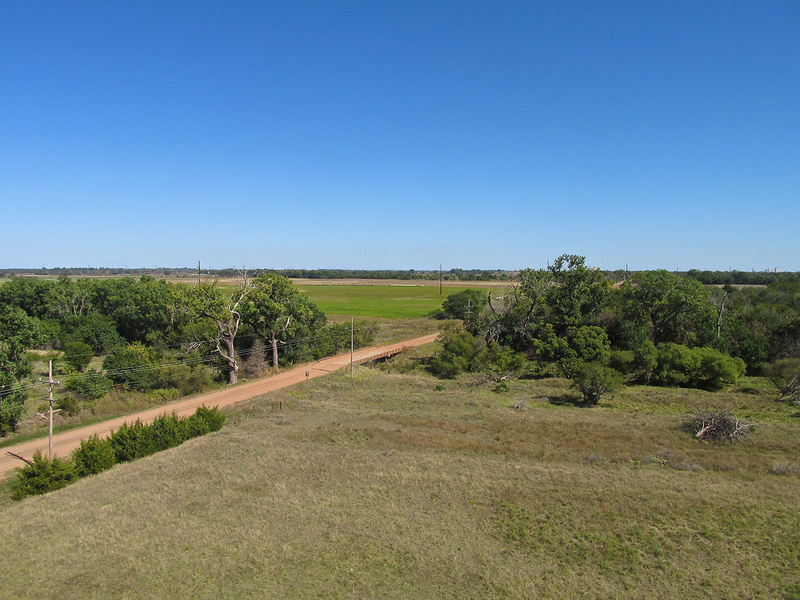 This photo is from 900′ AGL looking Northeast. Telephoto – same position. The decommissioned Goemann Strip is on the East side of the driveway. The final photo before landing. In order to not cross low over the houses on the Northwest side of Attica, I descended straight ahead from this position and then made a Left Hand Pattern to land. Although it was pretty windy, the landing was smooth. I extended the final approach in ground effect until pretty close to the driveway turnoff to Pat’s house. I then dropped to earth and stopped. We had discussed on the phone that I would need to shelter the plane from the wind so Pat motioned me where to taxi. Just after landing I turned to head back to the area where Pat was standing. We put the MXL in front of one of his out-buildings. We secured the Quicksilver out of the wind on the South side of his large out-building. A week before flying to Attica I had made a trip a bit farther Southwest to Waynoka, Oklahoma (story HERE). 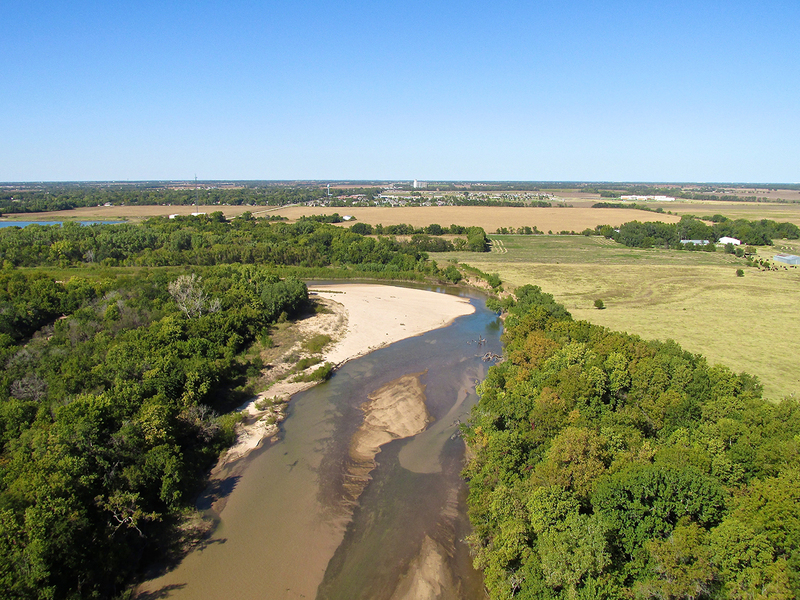 An unusual patch of terrain South of Waynoka is the Little Sahara sand dune park. 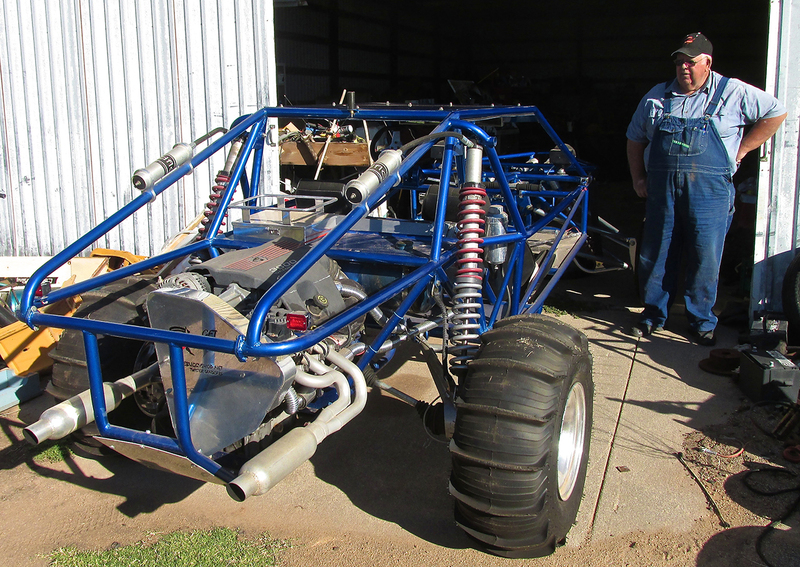 In the doorway of Pat’s out-building was the radical sand buggy shown below that he drives there. 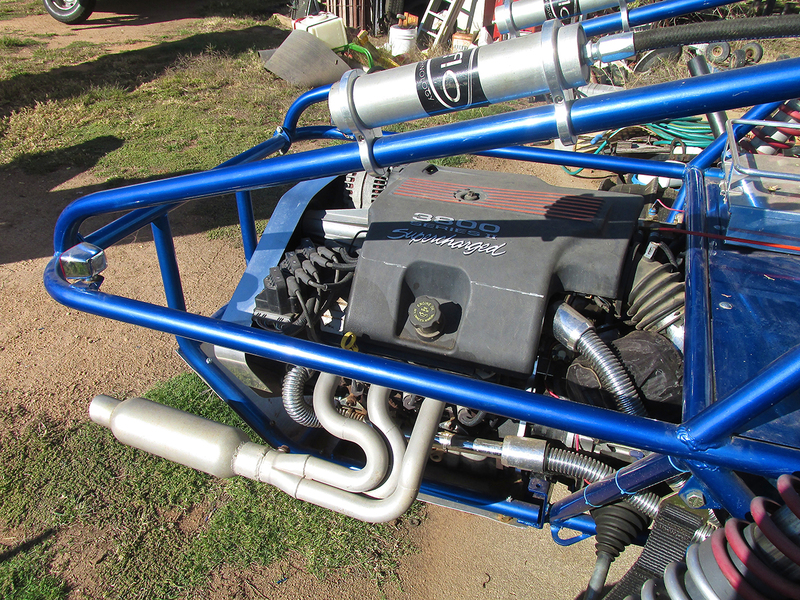 Except at the indoor Monster Truck and Super Mud Races, I had never seen such a machine. It’s called a Sand Rail. 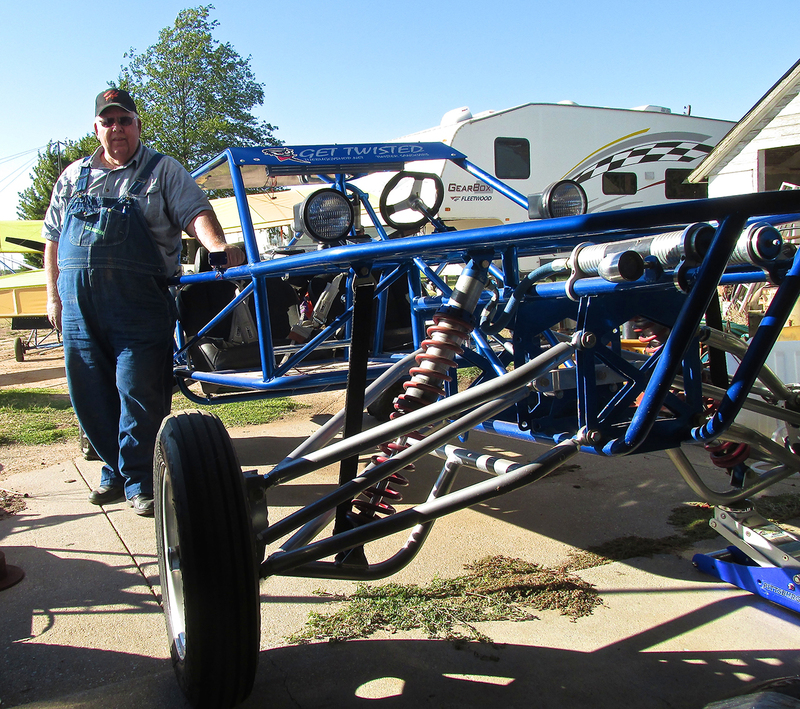 He bought it from a shop in Hutchinson, Kansas. After securing the Quicksilver and getting a good schooling on Pat’s Sand Rail, it was time to check out Attica. Pat had a wedding to attend in the early afternoon so we didn’t have a lot of time. We decided to visit the Attica Cemetery first. The entrance to the Attica Cemetery is simple but elegant. Upon entering the cemetery I asked Pat to stop for a second so I could take the picture you see below. Not intended as an artwork, this shot was taken to make a point. Most people would look at it and only see a cemetery. That it is, but notice the monuments – the headstones. They are vertical, reaching to the sky. We did not look at every grave but if not 100%, the great majority of the folks buried in the Attica graveyard have headstones – not “markers”. About three decades ago I had a conversation with my Mother as we visited my Dad’s Grave one Memorial Day. It was about the grave markers she and my Father had. He had already died and hers was yet to be engraved. They are stone with engraved bronze inserts. Suddenly, while standing there, it occurred to me that theirs, and the majority of the other graves in that urban cemetery, were markers rather than headstones. I asked why they didn’t have gravestones. 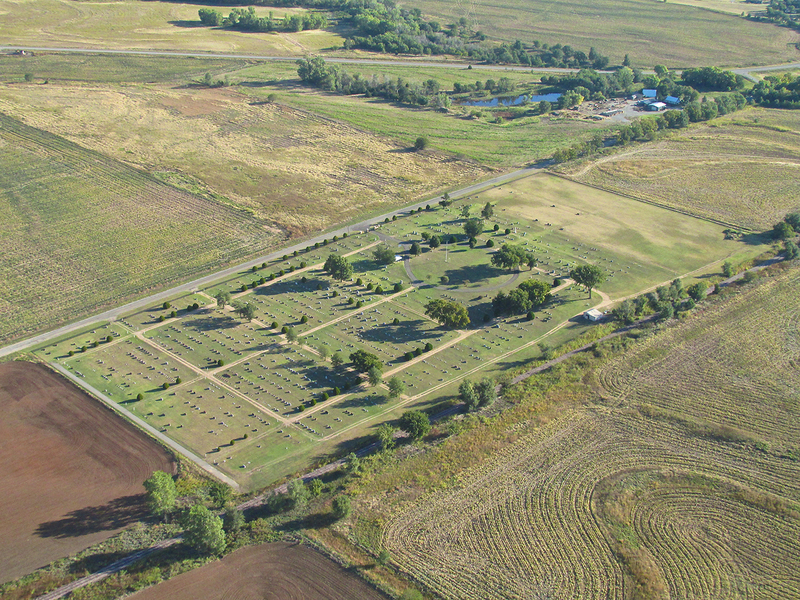 She said that was their original plan but after they had arraigned for the plots, the cemetery made a policy change and strongly encouraged folks to buy markers rather than headstones. The reason? So they could mow the cemetery grass more easily. I was shocked. Maybe I’m over-reacting, but to me, this was yet another example of a burgeoning “progressive” mindset in America. They want us to believe they couldn’t get a guy with a weed-eater out there a couple times a month? Please… My Dear Mother was never one to cause a ruckus or complain but I know she would have preferred gravestones. That the management of the cemetery had adopted such a materialistic position and imposed it on Mom during her grief at the sudden loss of Dad has never sat well with me. The symbolism of the gravestone is to provide a visible monument to a life well-lived in addition to pointing in the direction of the God and Heaven. 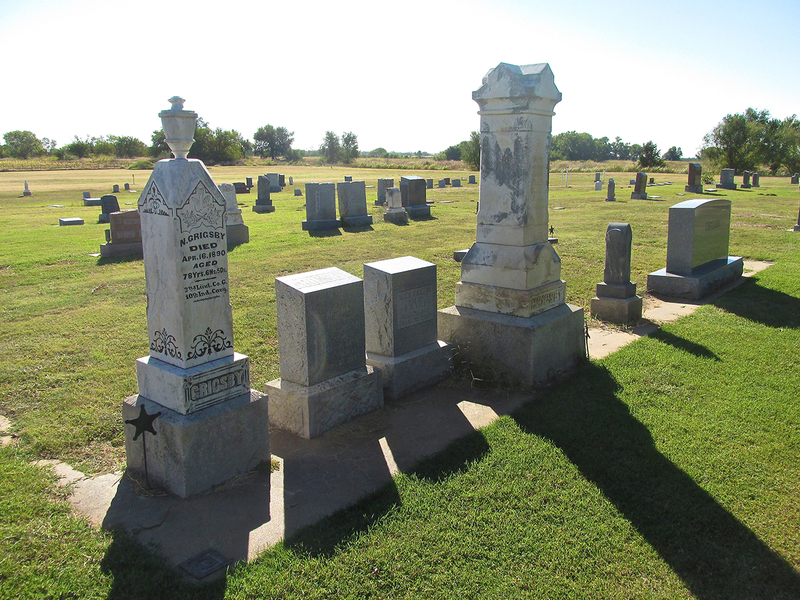 Sure, markers can provide information but gravestones are archetypes of a higher order. I realize that it is the quality of one’s life that matters – God is not impressed with our monuments – but, I believe they serve as a testimony to the living. Attica Cemetery just inside the entrance looking West. Here is the lineage from Nathaniel Grigsby to Gary Grigsby whom you will meet later in the story: 1] NATHANIEL GRIGSBY, 1812 TO 1890; 2] J.W. /JAMES GRIGSBY, 1849 TO 1933; 3] WALTER GRIGSBY, 1882 TO 1960; 4] MYROM GRIGSBY, 1915 TO 2001; 5] GARY GRIGSBY, 1945 – Present; 6] GARETT GRIGSBY, 1967 – Present; 7] DOSS GRIGSBY 1996 – Present. Nathaniel Grigsby – Prairie Prophet? People were deadly serious about politics in Nathaniel Grigsby’s time. At one point in his life, his promotion of Abe Lincoln required him to leave his home to avoid being killed by his neighbors. Later as things really heated up, he became a Lieutenant in the Army of The North. As a Cavalryman, you can rest assured Nathaniel had his share of minie balls whizzing by him on the field of battle. I say this to indicate the fervor of the politics of that era and the bona fides earned by Nathaniel Grigsby to hold the opinions he did. He did not come by them lightly and he stood up for them at the risk of his life. Consider these things when you read the engraving on his stone. 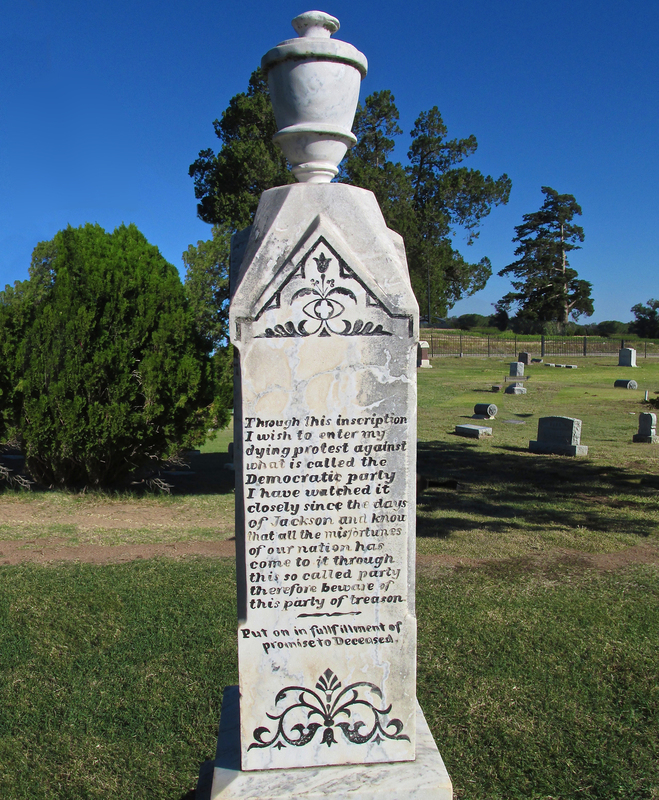 The West side of Grigsby’s monument features his particulars. The East Side cements his relationship to his friend Abraham Lincoln. The South Side of Nathaniel’s monument gives his stern warning to future generations of Americans. Naturally, while I was taking pictures of the Grigsby Monument, Pat had to hear the opinion I gave you earlier regarding gravestones. As we found on so many things, he concurred and told me about the gravestone his family had erected for his Parents. His description of it intrigued me. I asked if we could photograph it for this story, so we drove to the other end of the cemetery. Stone carvers can now etch drawings or even photographs on the surface of stone. 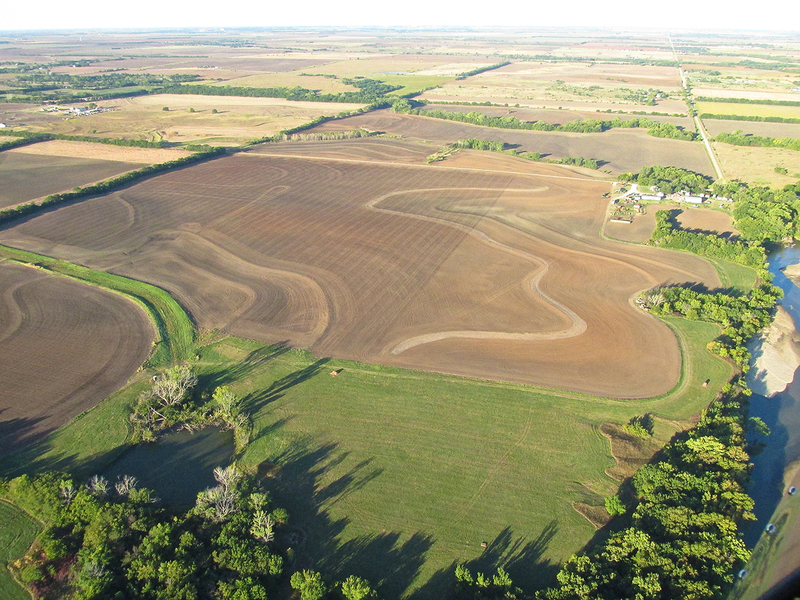 For his Parent’s Memorial, Pat had a drawing of their Kansas farm put on its face. The home was on “The Ridge” nine miles North of Attica. I like this gravestone a lot. The gravestone belonging to Pat’s Parents. My Wife and I are always remarking that we can go to an event in Wichita, which is not a large city, and not see one person we know or even recognize. That doesn’t happen in Small Town America. While Pat and I were taking the picture above, a friend of his pulled up in his car. 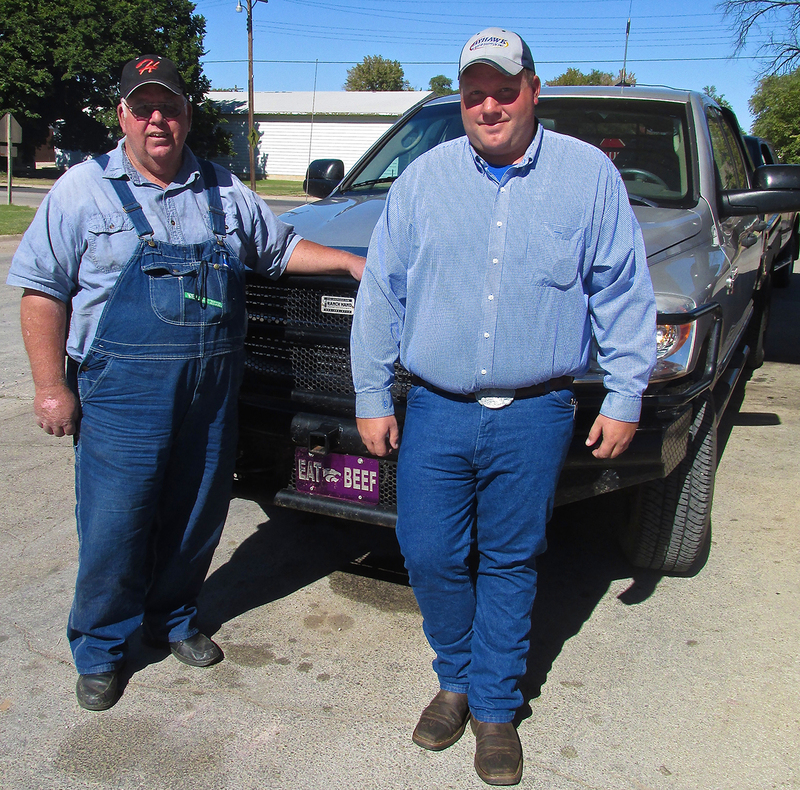 Wayne Neff is an entrepreneur with a catering business named Hog Heaven (tel: 620-243-4932). Wayne is also on the Board of Directors of the cemetery. It was shortly before lunch time and Wayne was making a swing through the graveyard to check things when he saw us. While talking with Wayne and Pat, I noticed another etched gravestone in the plot next to the Kernohans of similar nature to theirs. 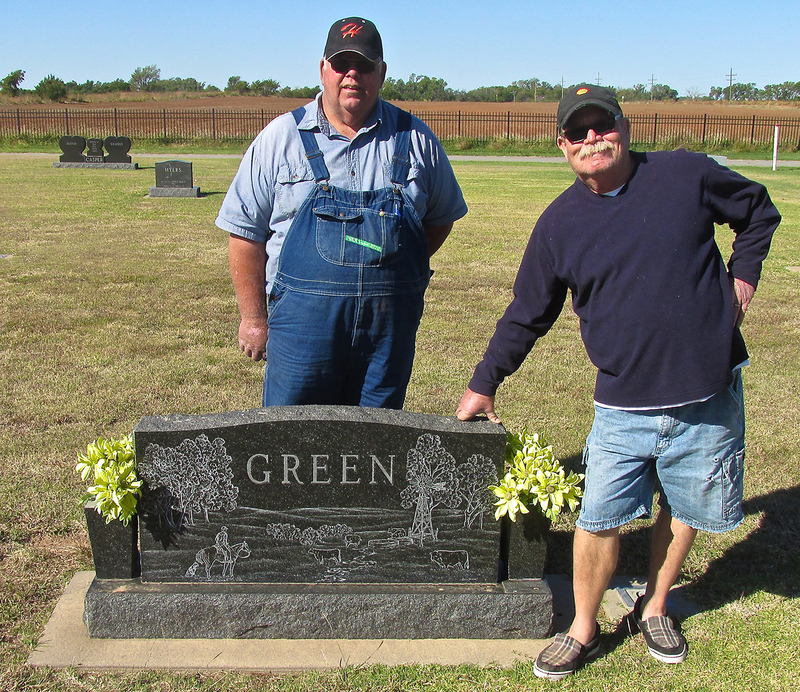 Pat said his Brother-in-Law Dale Green was buried there so I took a photo of it and the two of them. The Resting Place of Dale Green with Pat Kernohan and Wayne Neff looking on. Apparently there is an old desperado buried in Attica Cemetery. Pat asked Wayne if he knew where The Gun Fighter’s Grave was but he wasn’t sure and we didn’t have time to walk the whole place to find it. He did, however, show us the grave of an Attica Pearl Harbor Veteran who made his final rest there. 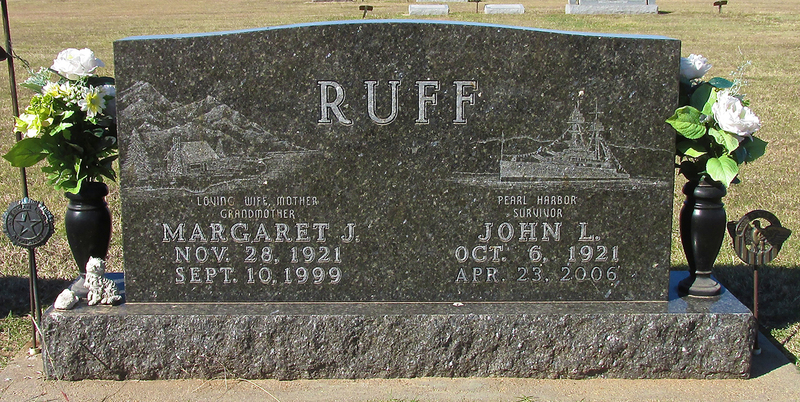 John Ruff was a sailor on duty in the harbor on that fateful day. He was aboard the USS Oklahoma when it was sunk by Japanese fighter-bombers. 429 of the crew died in that attack. John survived that day and then went on to serve on two other warships during the course of the war until the Victory over Japan. He returned to Attica afterwards and served as the Postmaster for many years. We said Goodbye to Wayne and headed into Attica to have a look around. Whenever something caught my eye, I would ask Pat to pull over so I could photograph it. He would tell me what he knew about it. Avenue C / Highway 160 cuts through the center of town. 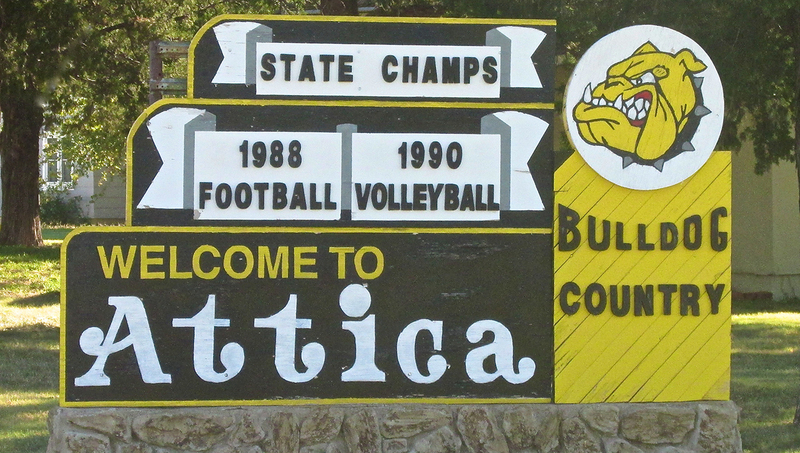 This sign welcomed us as we entered Attica’s West side. 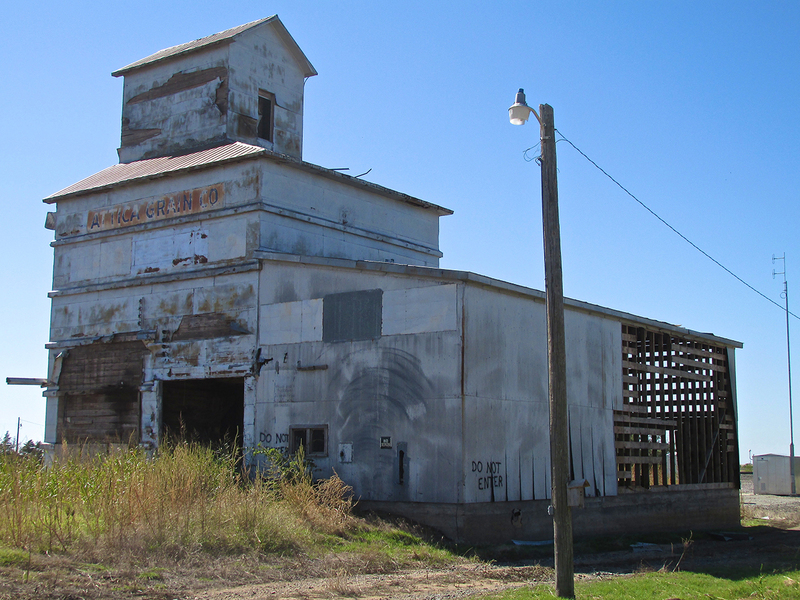 This classic grain elevator is next to the railroad tracks. The C.H. Lynds Building was erected in 1886 at the corner of Avenue A and Main Street. At times it has been a bank and a dental office. When I shot this picture, it was being used as a “House of Horrors” for Halloween. 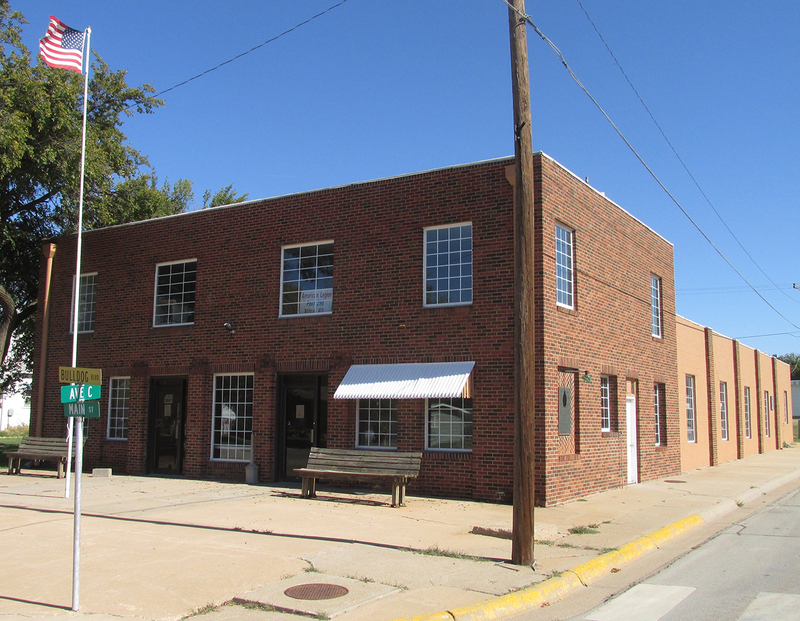 Diagonally across the street from the Lynd Building is this multi-story brick edifice that is currently unoccupied. Called the “C & H”, it was built in 1905. Attica Engineering is at 201 N. Main. At one time, they did a number of secret projects for Boeing. Boeing has left Kansas, though, and things have slowed down for AE. 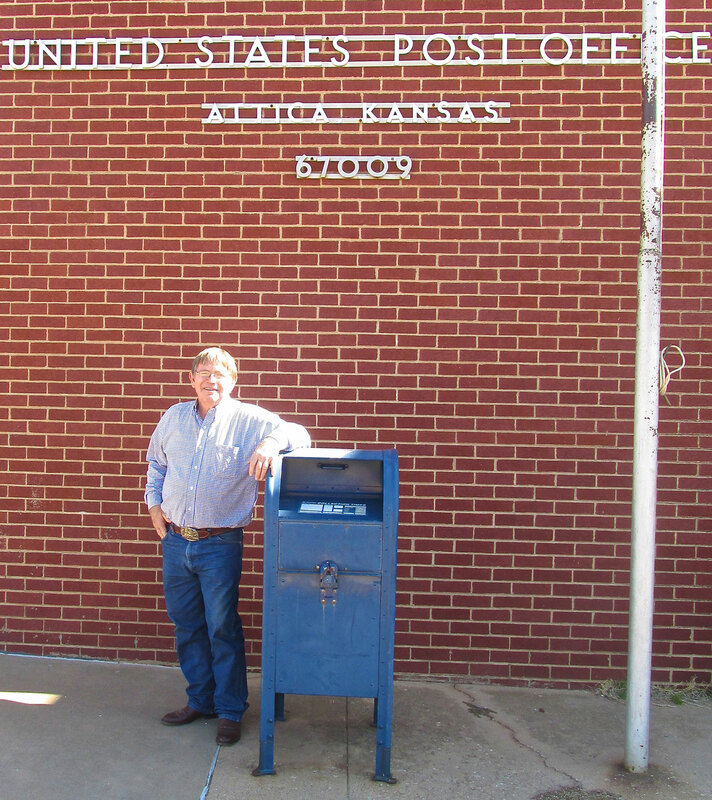 I was impressed by such a substantial American Legion Post in this relatively small town. 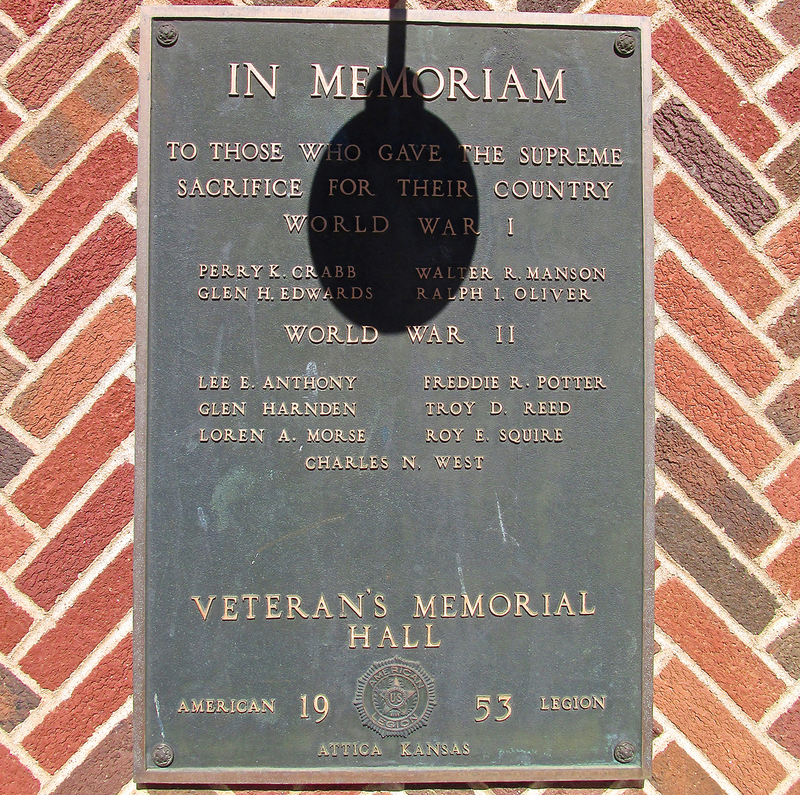 It is consistent, though, with the evidence of dedication and sacrifice I have witnessed in every small town I visit. Seeing how many men left these rural areas to fight for Uncle Sam in distant lands only to return in a casket is humbling indeed. It is good that we remember them. The American Legion Post at Bulldog and Avenue C. I made sure to include the Flag they have flying proudly at the entrance. The more Pat and I drove around town, the more things I saw to take pictures of. We pulled into a gas station to make a pit stop. Pat looked over and said, “Well, look who’s here”. It was his son Kris, who works in the Oilfield Service Business. While they were talking, Kris reminded Dad that he needed to get to the wedding. So Pat told me we were going to have to head back to his house. About that time, Gary Grigsby pulled up in his car. After assessing the situation, he said he would continue the tour. I thought this was great so I said Goodbye to Pat and Son and jumped in the car with Gary. Gary Grigsby – Great, Great, Grandson of Nathaniel Grigsby. Although “Land Man” has a different connotation in the Oil Business, for Gary I use it because, as I mentioned earlier, he and his Wife Rogena are in the Real Estate Business. My experience over many years in the Advertising Business, is that people in American Small Business aren’t in the particular vocation they have chosen just to make money. Most all of them have a deep affinity and love for the work they do. This is evident with Gary. He knows the history of the Attica area well and can tell you much about it. 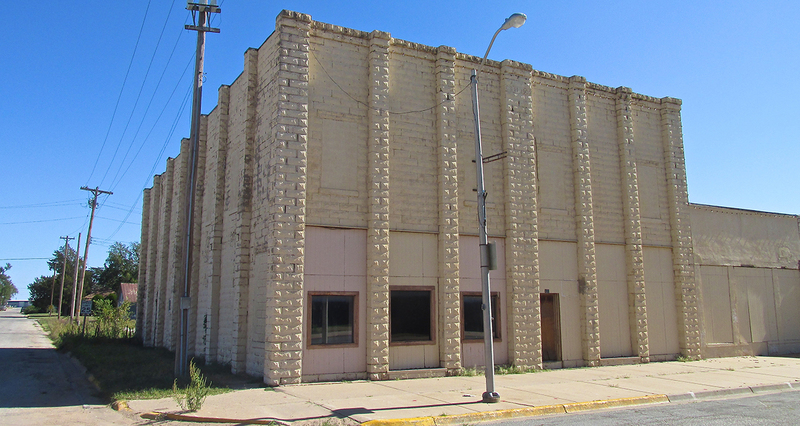 One property that looms large in area history is the building shown below. At one time it was on property Gary’s Grandfather farmed. 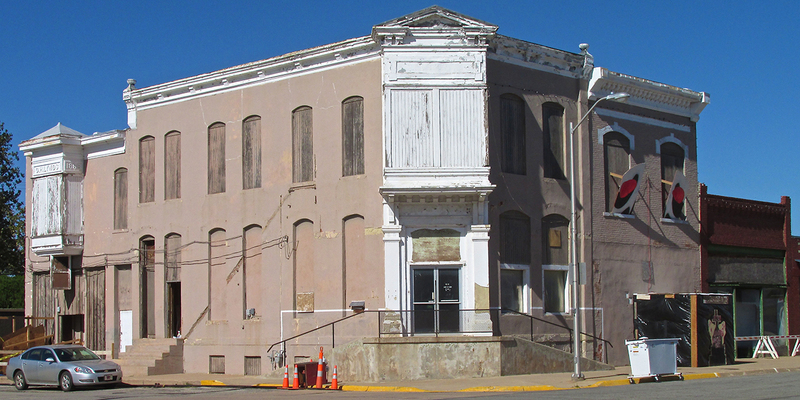 It’s place in history, though, was as the home for The Artist Guild of Attica. In 1955, Life Magazine featured the Attica Artists in a story called “Art Conquers Attica”. Gary has a few copies of that Life Magazine that I looked at. Life Magazine was the pre-eminent, photo-journalistic effort of its era. Recently, it occurred to me that The Flite Blog™ has been inspired to some degree by Life because I was always enthralled by the photos and stories in that magazine. The Life Magazine story about Attica’s Artist Colony brought the town national recognition. Because they are copyrighted images I cannot show them in my report. Instead, I have a link to some of the pictures from that story so you can see them HERE. 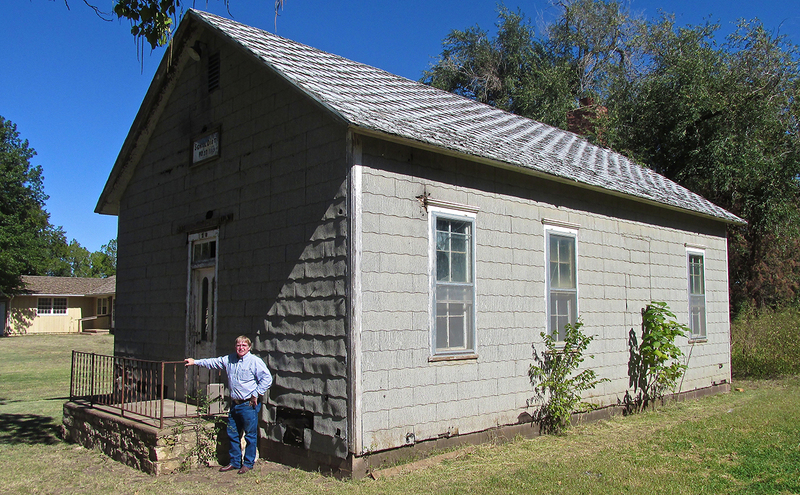 Gary in front of the old schoolhouse. If you look carefully you can read “Artist Guild of Attica”. 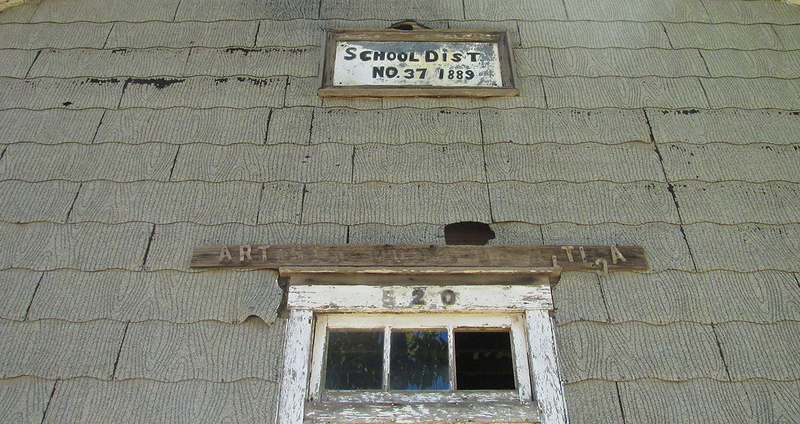 This building contains Attica’s Kindergarten through High School. Adjacent to the school building is the Attica Community Wellness Center. It contains a full size basketball court and a complete weight room in addition to other exercise and wellness amenities. Gary told me Randy Newberry of Attica’s R & B Oil & Gas, wanting to give back to the community, was a “prime mover” to the funding and maintaining of The Center. After looking at the Wellness Center, we rounded a corner and the home seen below caught my attention. Gary said “The Hacienda House” had previously been at Main and 160 but was moved to this location some time ago. 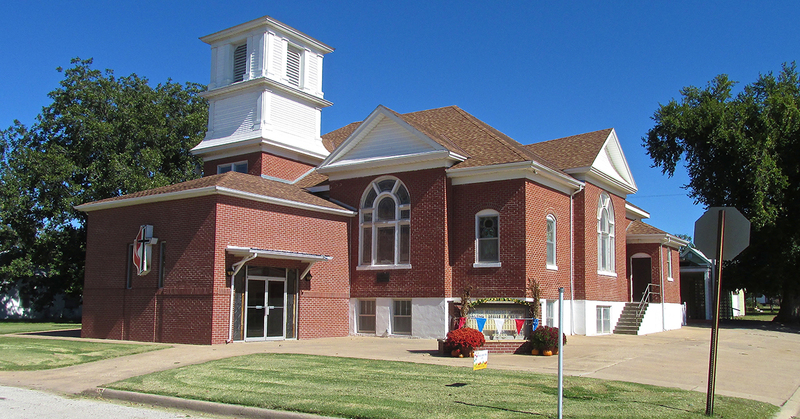 A number of towns in Kansas feature “Wizard of Oz” exhibits. This house is not an exhibit per se but it looked to me like it could have been in the movie. 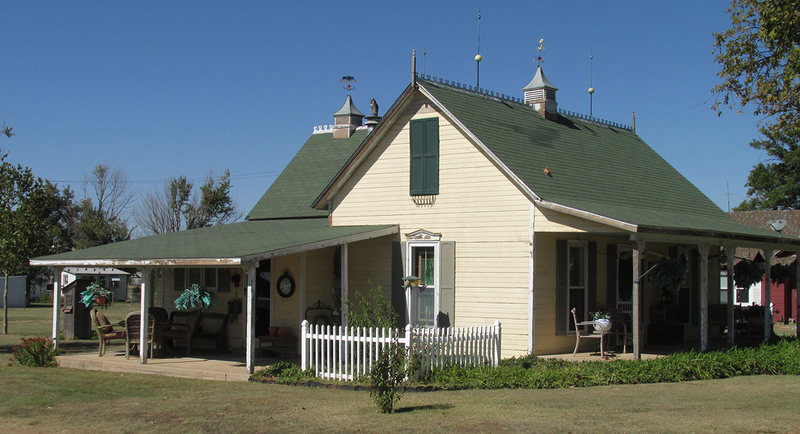 The colors, the porches and the roof line lend itself to the OZ look. The Northeast wind was continuing to build and Gary was concerned I might have trouble getting back to Wichita. I wasn’t too worried about getting there but I knew as the head wind speed rose, the longer it would take to fly into it. I had told my wife I would mow the lawn that day so I was going to need get home at a reasonable time to do that. Gary had mentioned some historical photos he had at his office so I asked if we could see them before returning to my plane at Pat’s Farm. 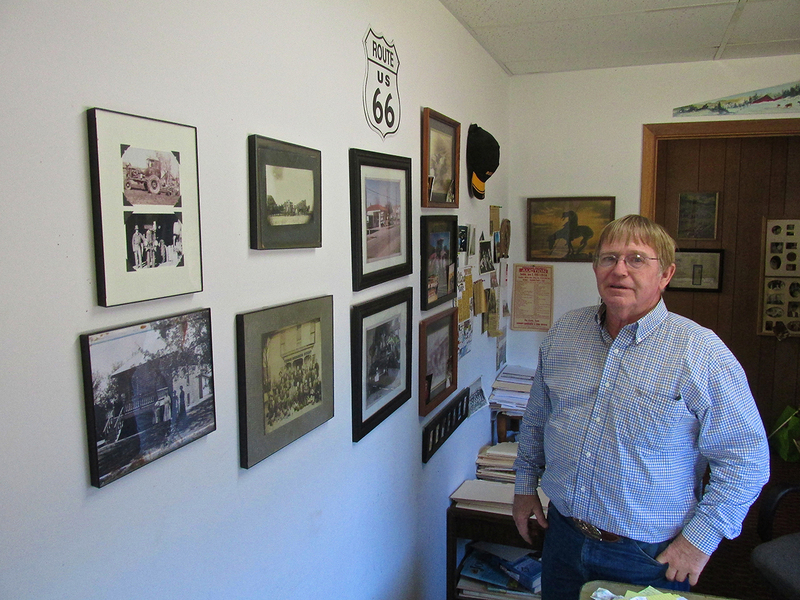 In this room of his business we see Gary with just a few of the many historical photos and artifacts he owns. He keeps most of them at home. 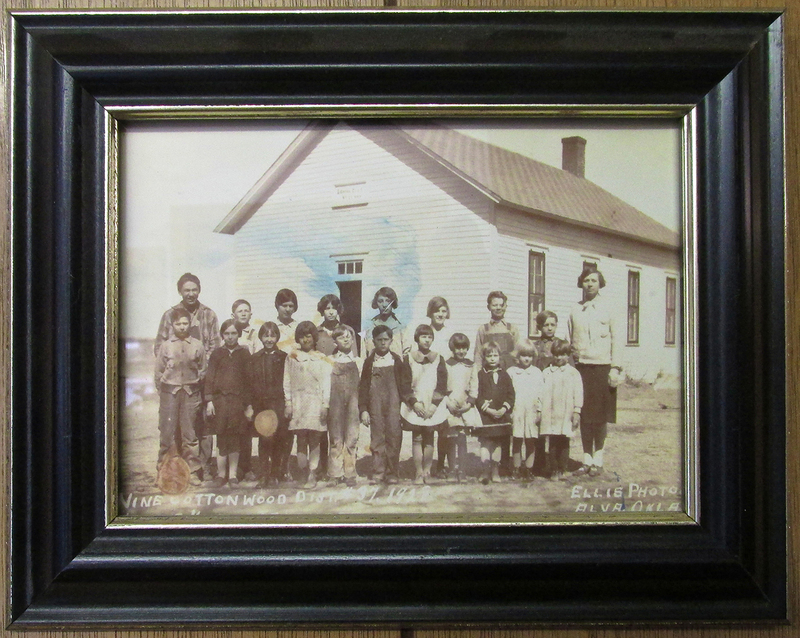 In his office Gary has a photo of the Schoolhouse we had earlier visited. 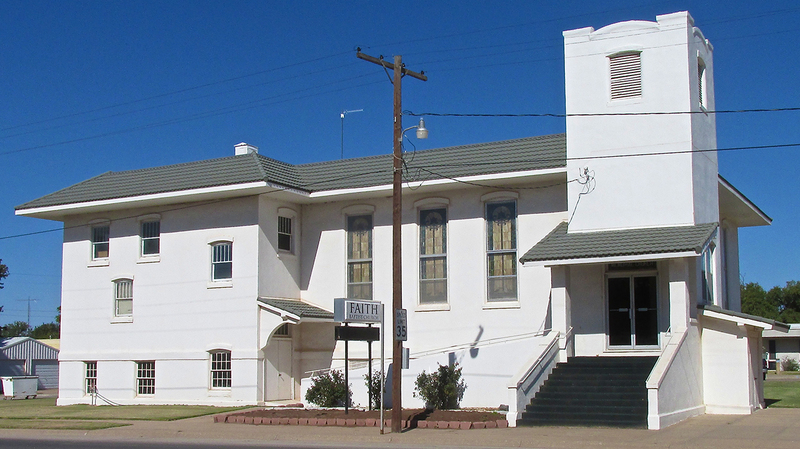 This photo of the Schoolhouse and later home of The Attica Artist Guild was taken by Ellis Photo of Alva, Oklahoma in 1922. 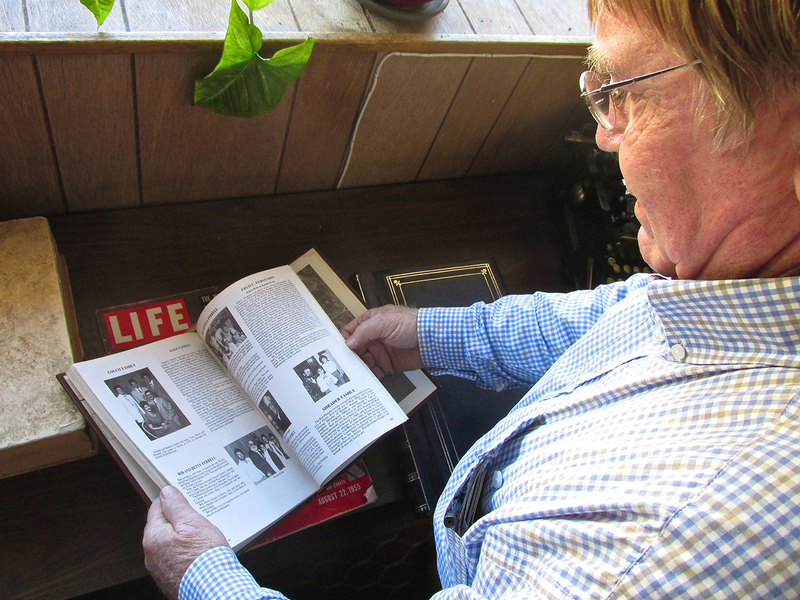 Here he shows me a “Book of Family Histories” and then the Life Magazine I discussed earlier. 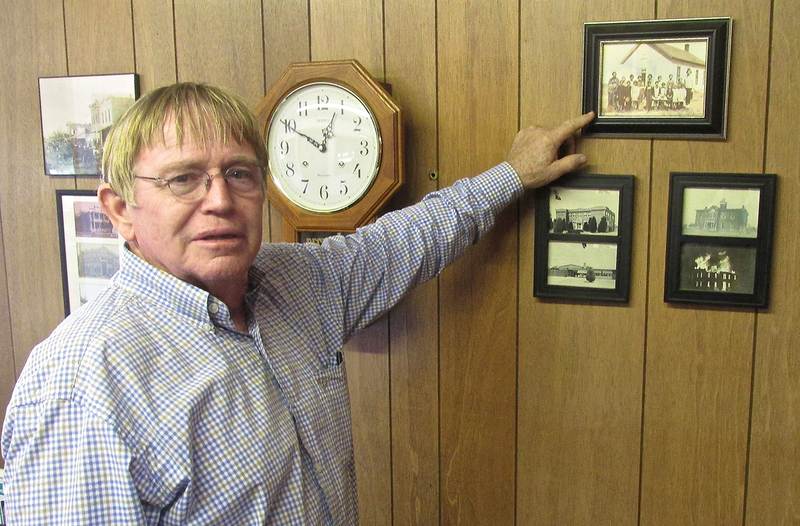 Gary has a copy of an old photo of Karl Garver at Lone Tree Ranch just South of Attica. Gary has this copy of an original handbill promoting the shows. I hated to leave because Gary had so many interesting historical pictures of The Flying Circus and Attica in general. But, it was getting pretty windy. Earlier in the season, a return trip into an equivalent stiff head wind took me two and a half hours to travel 63 miles (The McPherson, Kansas Flight). I love the flying time but didn’t want to risk running out of fuel or daylight. Prudence dictated a 2 to 3 pm departure. We headed back out to Pat’s House. 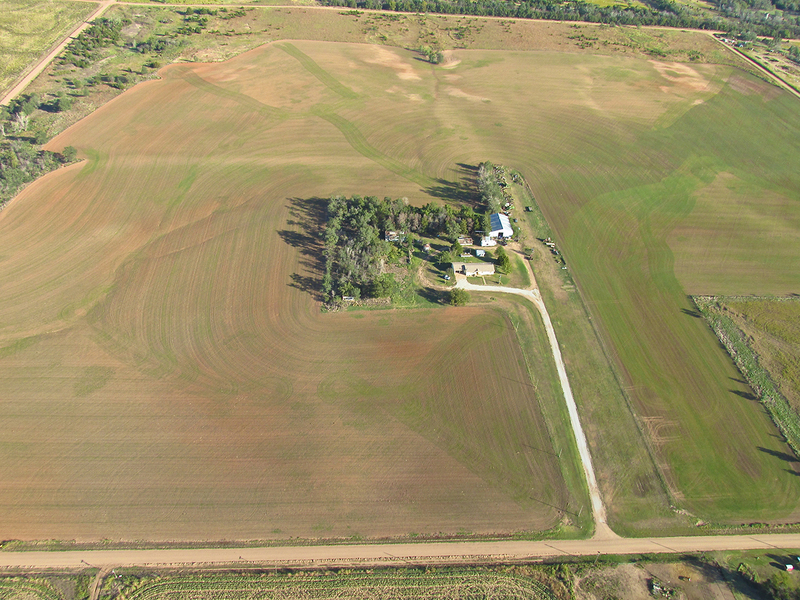 I asked Gary to stop so I could get this shot of Pat’s Farm with the new wheat planted in the foreground. Before we untied my plane, Gary took this shot of The Sky Surfer ready to make the trek to Selby Aerodrome. Before he changed his name, Boxer Cassius Clay had a famous line I will borrow from here. In the runup to his fight with Sonny Liston, Clay said his strategy would be to “Float like a butterfly; sting like a bee”. Since I would be flying directly into a 20 mph wind that was gusting to 30, I would adopt the first part of Clay’s immortal line and “Float Like A Butterfly”. Years ago I was given a “naturalistic observation” that provided some of the basis for my Long Distance Ultralight Flights. I was in my backyard with my dogs. The wind was about 20 miles per hour from the South with gusts to 30. It was windy enough that the birds were sitting it out. Out of the corner of my eye I saw a small, bright, yellow object making its way across the face of my fence. It bobbed up and down and side to side but maintained a constant movement forward into the wind. It was a butterfly! By all rights, it should not have been able to fly in that wind at all, much less make headway against it. At first I assumed it was only able to make forward motion while being partially shielded by the fence. The fence was North/South – in line with the wind – but I decided it was shielding the little creature somehow. Then, amazingly, the butterfly flew above the top of the fence and kept going though an area with many bushes and trees reaching altitudes of 2o to 30 feet until it disappeared behind the trees. I noticed when it was clear of the fence its “zig-zagging” increased in amplitude but its forward motion continued unabated. I pondered this for some time. Since then I have witnessed other butterfly flight demonstrations of this sort and have drawn some conclusions. In the study of aerodynamics or fluid mechanics is the concept of a boundary layer. In the context of aircraft, this describes the air layer that is “attached” or “viscous” to the object near it – generally a wing, propeller or fuselage. What it tends to do is to “grab on to” and “distort” the on-coming, non-viscous air mass. Most study of this effect regards high airspeed and has been conducted to enhance the ability of high performance aircraft to cut through the air with less drag. I can’t remember seeing anything about boundary layers at low air speeds. But, as I thought about it, it seemed obvious that the butterfly was making use of boundary layers at relatively low air speeds. In windy conditions there is a boundary layer around all types of objects. In the case of the butterfly, his objects of interest are trees, bushes, tall grass, and fences. Because the wind inside the boundary layer is “viscous” and therefore considerably slower than the greater moving air mass around it, the butterfly was able to make headway by flying through the slower moving boundary layers around the trees, bushes and fence. Thus, while he appears to be flying forward against a strong wind, he is actually making decent headway by flying through relatively slow boundary layers attached to these objects. Harry Callahan wasn’t talking airplanes when he uttered that line but the wisdom is well taken. A lot of pilots would rather think of themselves as a Golden Eagle when flying. That really misses the point for Ultralight Flying. 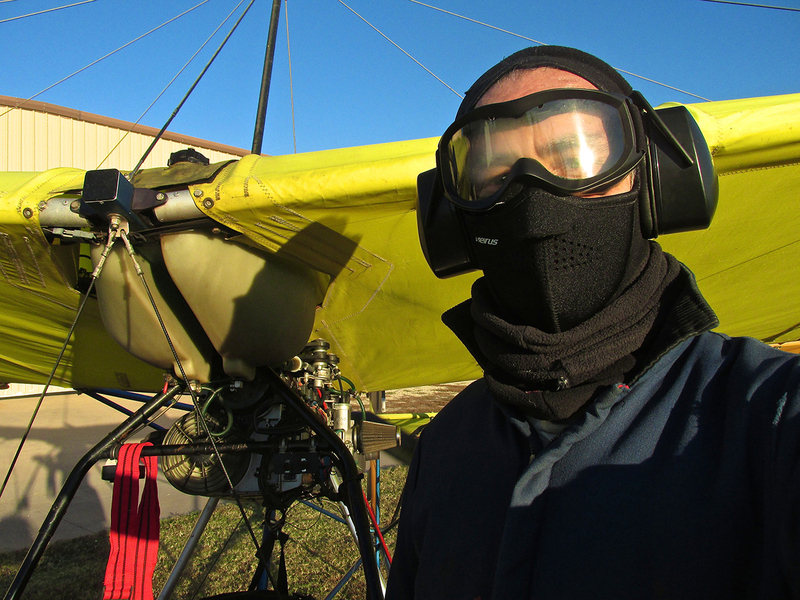 Taking inspiration from the Boundary Layer discussion above, if you are an Ultralight Flyer, it is far more useful to think of yourself as a butterfly. Ultralights have everything in common with them: low wing loading; lots of drag; relatively low power. A few years back, I adjusted my mind to this. After that my Ultralight Flying experience made a quantum leap. It has become far more interesting and challenging. Now it is more like airborne judo or kung fu. Now I don’t take the hit straight on. I allow it to move past me. Here’s how that plays out. I stay extremely low and when possible fly around, rather than over, hedgerows. It works well and has permitted me much farther range on the limited fuel I can carry. But, if you try this, don’t forget that Butterfly Boundary Layer Flying can only be done if you have good “stick & rudder” chops and maintain constant vigilance lest one of the objects adjacent to the boundary layer reach out and smite thee. I thanked Gary for his tour of town and for the ride back out to Pat’s Farm. We untied the plane, put all of Pat’s stuff away and I pre-flighted the MXL. Everything looked good so I fired her up, taxied out and took to the air. Just after takeoff I climbed so as to clear the area and take a couple more pictures. It was fairly turbulent but I twisted around in the seat to get this last picture of the Kernohan Home. Gary Grigsby is watching from his car. 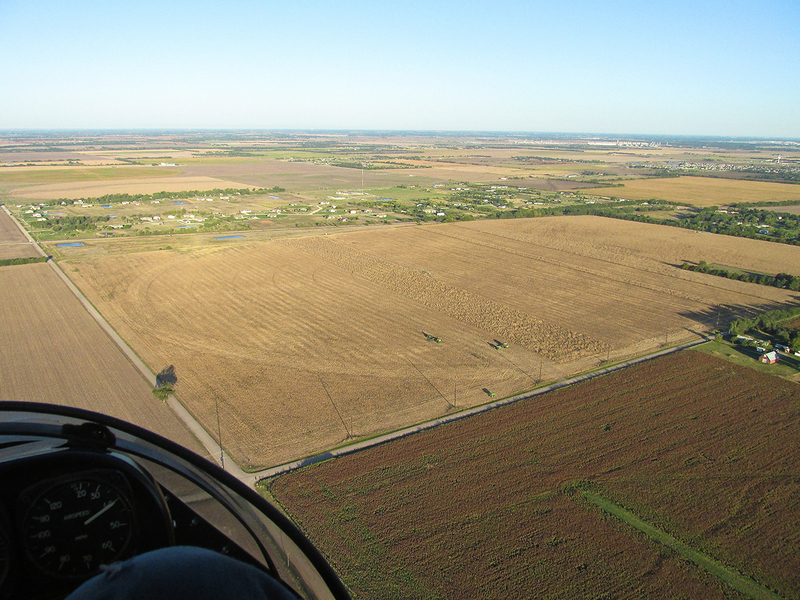 Attica from 300′ AGL looking South under my right wing. A little past Logan Street coming out of Attica’s North Side, I dropped down to begin my trip back. Lately I have become a Sean Riley follower. He is the host – better would be “Great Adventurer” – of National Geographic Channel’s “World’s Toughest Fixes”. The guy is a superb athlete, skillful rigger and very effective host. Providence is a continual theme in my Flite Blog™ writings and again loomed large in this flight to Attica. The week before the trip I had watched Riley climb all over high tension power lines with a crew in Pennsylvania. 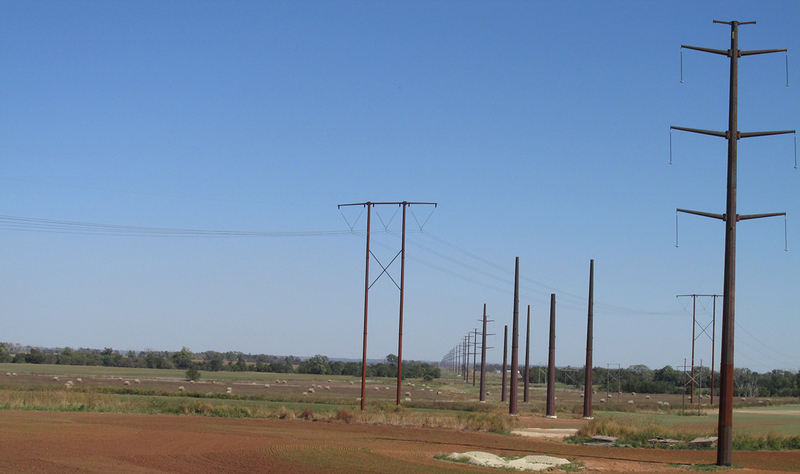 Not long after leaving Attica I came upon a new power line project that provided two benefits. One, was that I got to see the building process in stages. Since I had seen his show, I recognized elements from it in “real life”. Secondly, the path of the power line for many miles traced exactly the direction I needed to go! This allowed “The Butterfly” to track through all the hedgerows instead of having to climb over them or detour around them. It was deluxe! When you see these power lines I suspect a lot of folks will get queazy. I want to assure you this is not “dare devil” flying. To remind you, my Ultralight is flying between 38 to 42 miles per hour. On top of that, even utilizing this “boundary layer business”, the headwind still costs me 5 to 8 miles per hour. So, I am netting a ground speed of only 30 to 38 miles per hour. This makes for plenty of time to look ahead and plan a path. There is plenty of room along “the corridor”. It is excellent fun. Approaching a new high tension line installation. A major junction. Three different lines cross. It was very hard to take these pictures because of the turbulence. For a while, the new line paralleled an older smaller high tension line. There was plenty of room between them so I flew the corridor for a while. 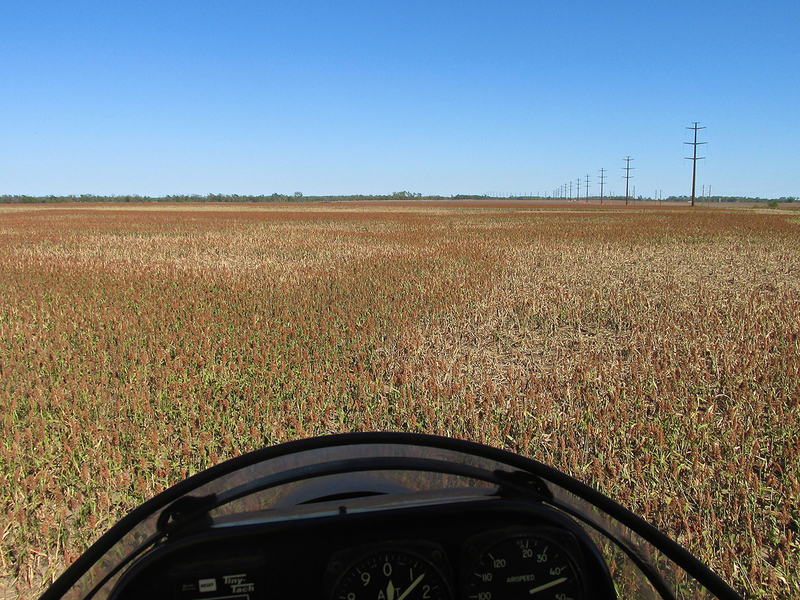 At this point the power lines diverged enough from my flight path that I crossed over this milo field. 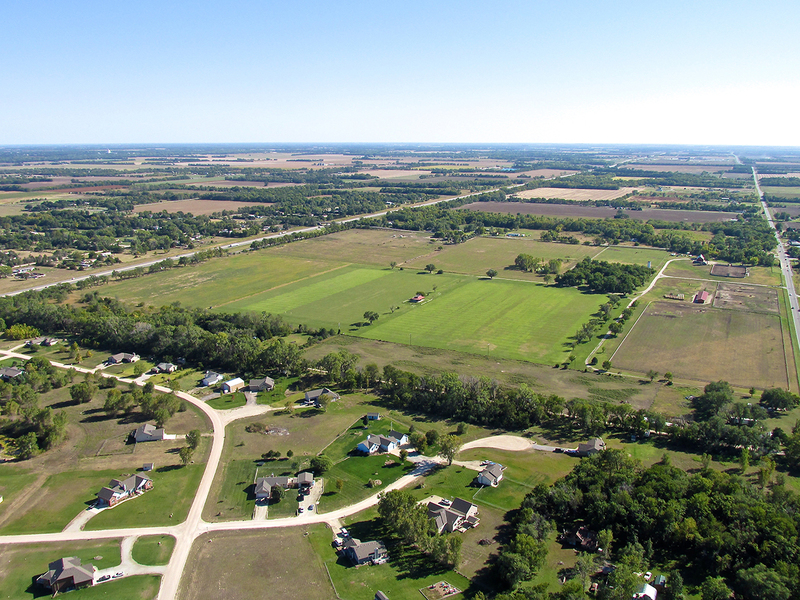 This “GlennView“ was taken at 3′ AGL looking Northeast. Then I noticed the pulleys hanging from the insulators. I had seen this on the “Greatest Fixes” TV show. These pulleys are attached to the ends of the insulators and then new electric cables are pulled through them. Sure enough, after a few more miles I saw a cable staging area ahead. 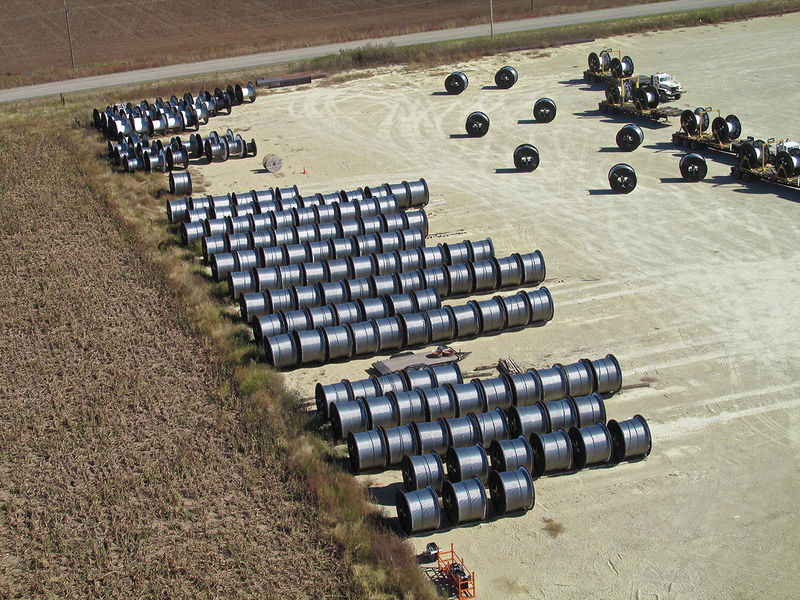 The North End of the yard contained many spools of new electric wire being readied to string between the poles. Then a little further and I saw this bulldozer holding a length of cable taught. Long stretches of cable like this are extremely heavy. It appears to me that the section going to the right had been completed. The next order of business would be attaching it to the section coming toward the camera. That would have to wait until Monday because it was Saturday and no one was working. 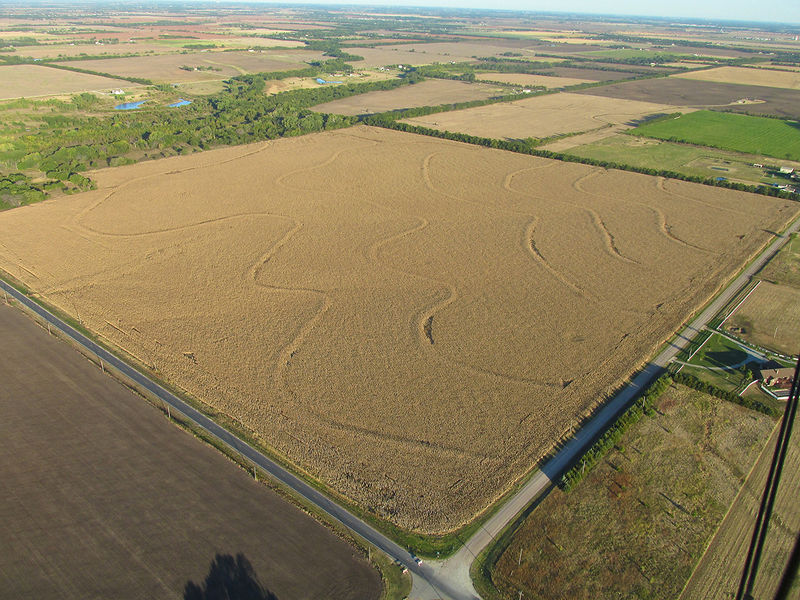 After leaving “The Power Line Corridor” I came upon this interesting plowed field – looking East from 10′ AGL. After taking the previous shot, I noticed this sharp Quicksilver Silhouette in the fertile dirt below. 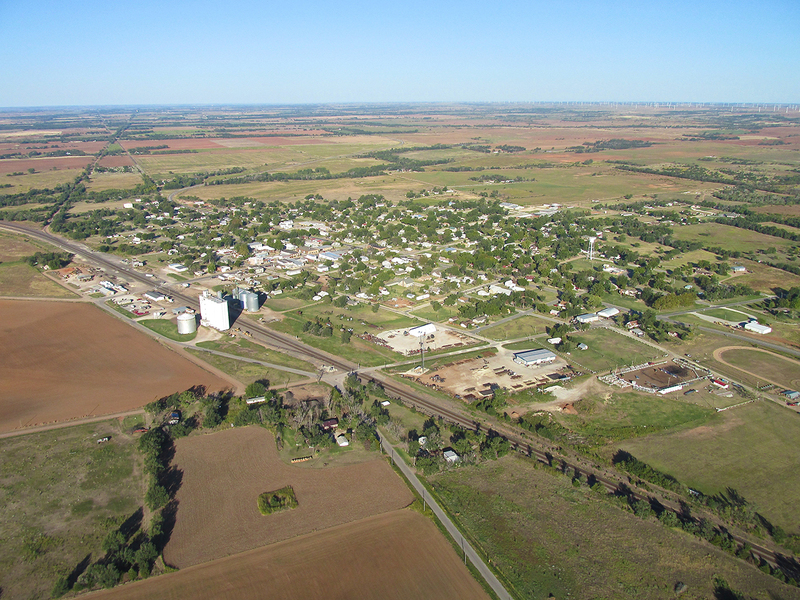 As I crossed the Ninnescah River I took this picture of Clearwater, Kansas from 300′ AGL looking North. 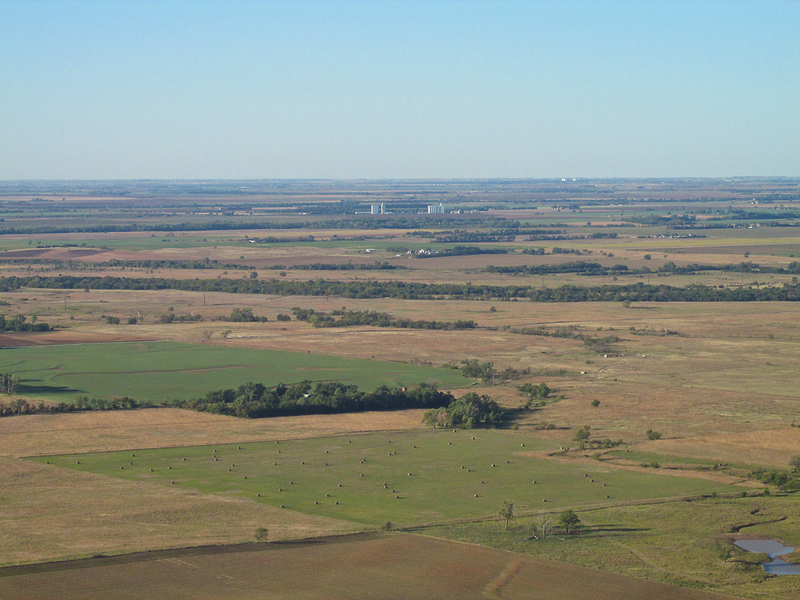 This is about 20 miles South Southwest of Wichita which you can see on the horizon. I am at 500′ AGL. 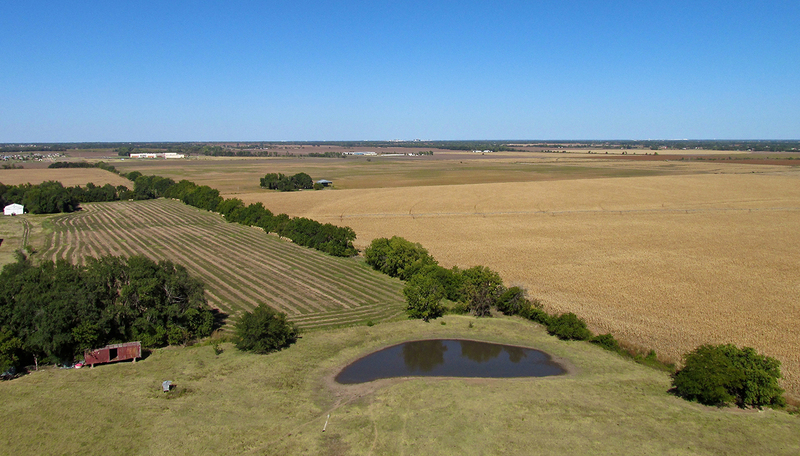 One of the few corn fields remaining to be harvested is in the foreground. 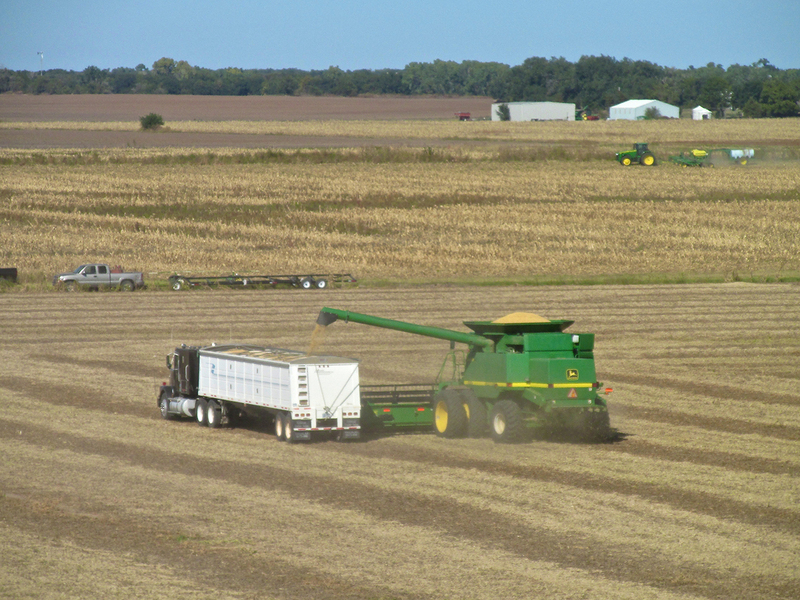 A mile or so later these guys were harvesting corn. I shot this with the telephoto. 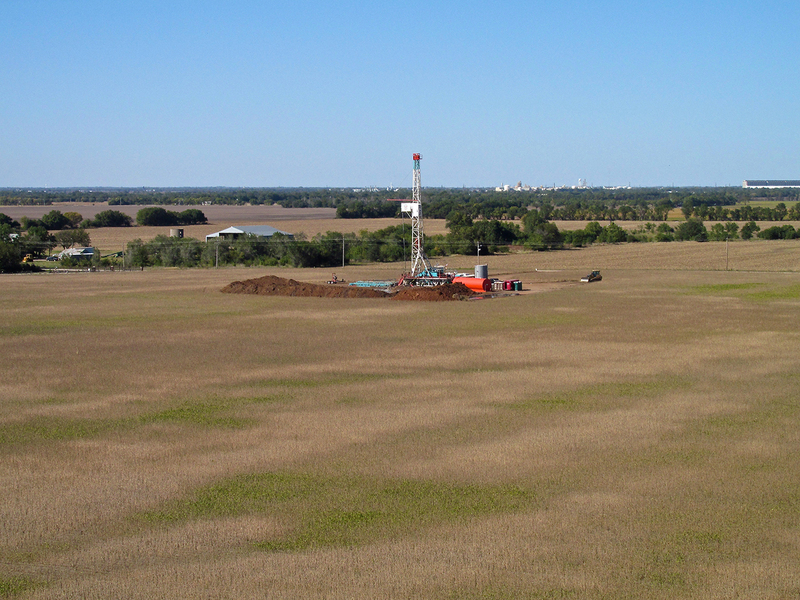 Getting closer to home base but with the head wind maintaining and still flying fairly low, I caught this shot of a crew drilling an oil well South of Haysville, Kansas. I am at about 75′ AGL looking Northwest. On the horizon just to the left of the rig you can see Air Products. To the right of the rig is Occidental Chemicals and at the far right the DeBruce Grain Elevators. This repeater tower is my West Marker for Selby Aerodrome. It is precisely West of the field and features a blinking beacon at night. 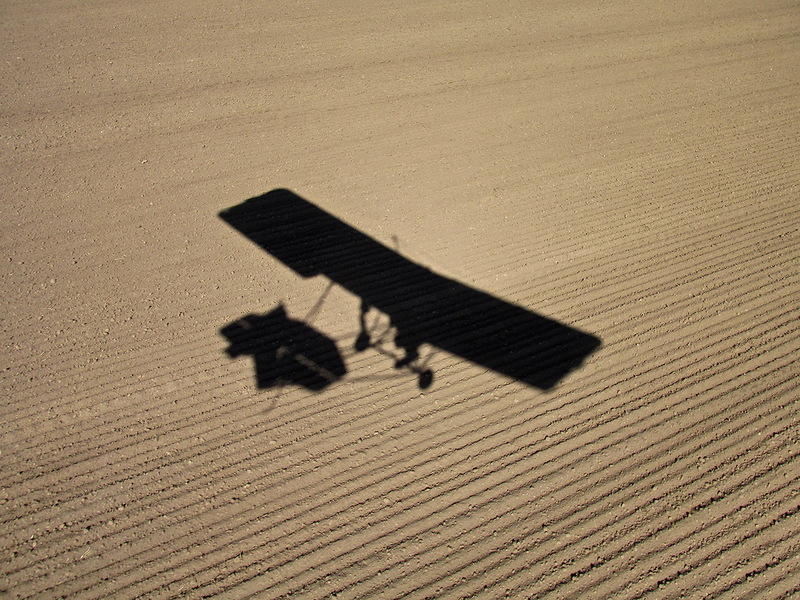 Ultralights can fly up to 1/2 hour after sunset. At that time of day, everything on the ground looks quite different and it is possible to get lost. This tower comes in very handy at dusk when I am trying to find the field. Another harvest in progress. Note the “Sunspot” enveloping the plane’s silhouette. The Haysville Saddle Club. Most Saturday mornings there is action here. 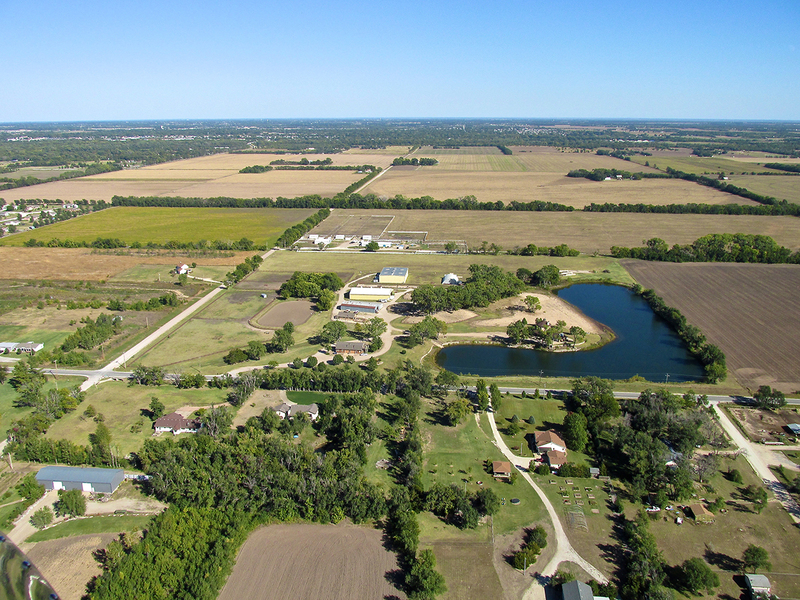 I am at 700′ AGL and climbing to pass over the housing area and I-135 just before I reach Selby. 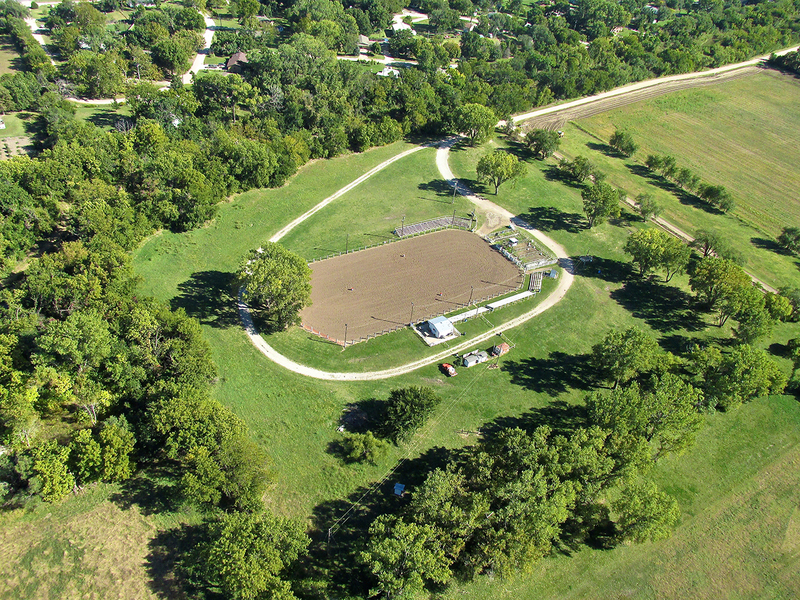 The Fairfield Polo Club. Usually the grass looks much better but it is the end of the season. I am at 1,000′ AGL looking Southeast. The highway cutting through the upper left of the shot is I-135. The road barely seen at the right edge of the picture is South Broadway Street/Hwy 81. The sky was clear so, before entering the pattern for a few go-arounds, I took this shot with Selby Aerodrome and Horse Ranch in the center. I am at 1,000′ AGL looking straight East. I wasn’t the only one besides the few random butterflies using minimal power to fly across the prairie that day. 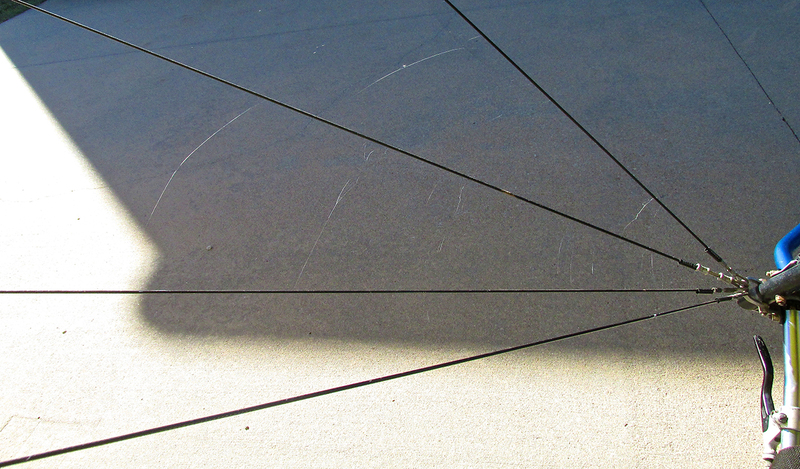 There were also countless spiders in the airspace using gossamer threads to “kite” their way to destinations unknown. A few of them must have felt like they touched off an afterburner when they hooked on to my wing cables. After landing I saw them all over the plane so I pulled near the hangar shadow so you could see a few attached to my flying wires. 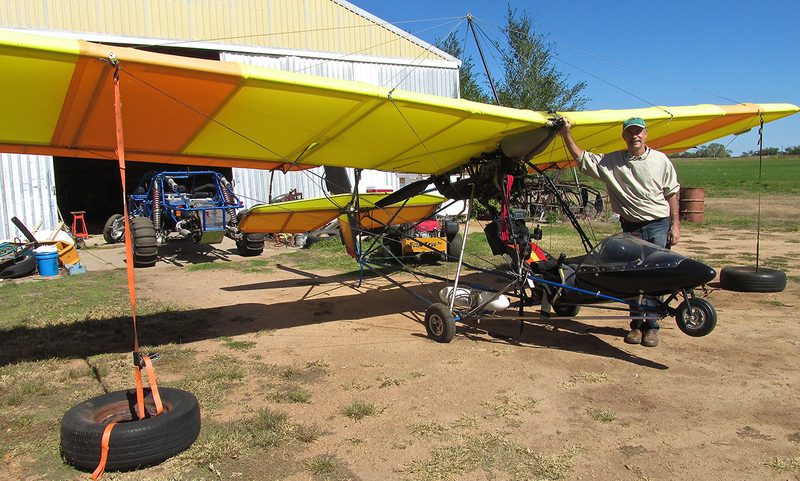 Ultralight Flying – low and slow – has been generally ignored by the Aviation Establishment. Most all aviation research goes into High and Fast. That makes sense because that’s where the money has been. 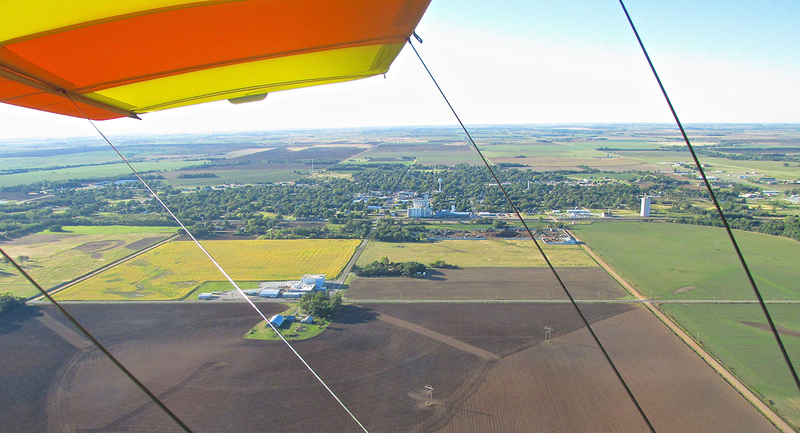 But for the sheer joy of flying it is hard to beat Ultralight Flying. In addition, the more I fly my Ultralight, the greater appreciation I have for the capabilities God has given his creatures which traverse the air. I hope to continue gaining insight into flying from the observation of their flying behaviors. The Birds, The Butterflies and now The Spiders – all make their contributions. Glad you liked it. Attica and the guys there were very interesting. Traversing “the big poles” on the way home was icing on the cake! Hey, I enjoyed the Attica very much yesterday and am apparently blind to sun spots – I think you’re pulling my leg? HA. Attica sure had some interesting features, the old buildings and such history. Wow, neat article on your part. Thanks! It was a great flight. 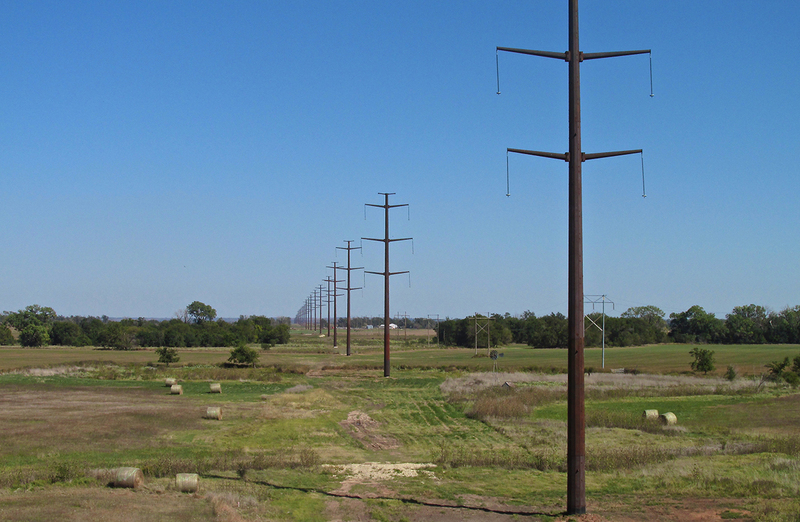 I still think about weaving through the High Tension Line Project. Nope, “sunspots” are real. Look closer and you will see what I mean. Really enjoyed all of these pictures and your commentaries – you’re very talented! I grew up in Wichita (must disagree with you, at a population of almost 386,000 it doesn’t see “small” to me), but my Dad grew up in Attica and I have many happy memories of it. Thank you for your kind comments. God gives us all different talents. How we use them is up to us. I am happy that my photos and writings about aviation, small town America and the beauty of The Great Plains have been of interest to folks. I have many trips planned for 2014. 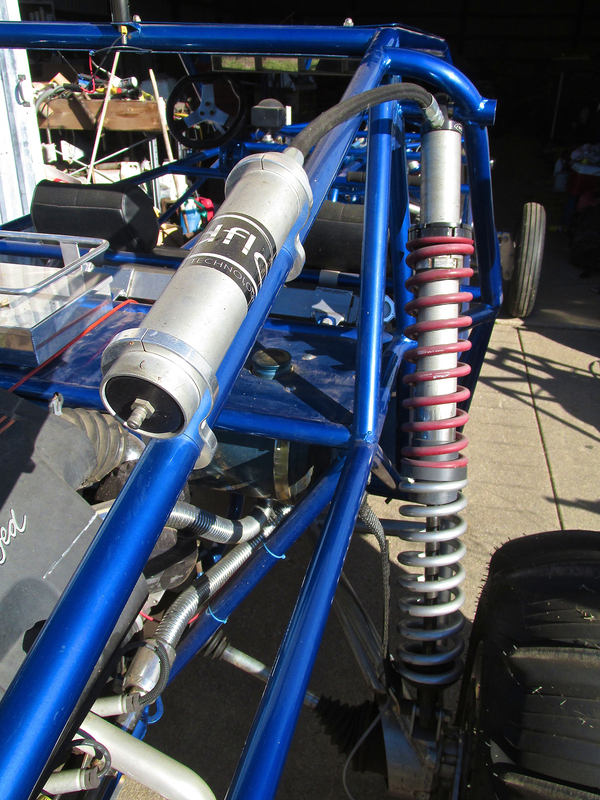 Now that you are on The Flite Blog, you will receive messages when something is posted there. Please point any and all you think might like this sort of thing. It was shot in the desert of Southern California. Glad you enjoyed yourself here. Next time you get out this direction you need to go west, not east, from Attica. 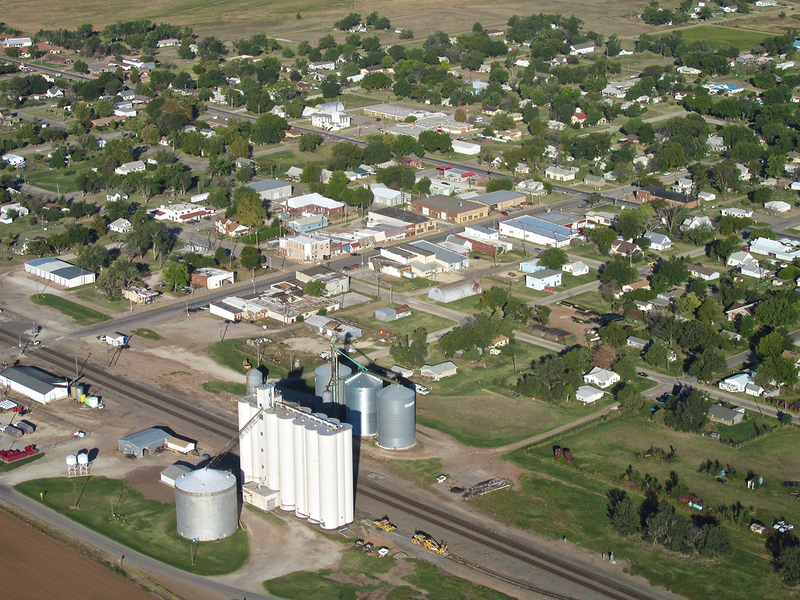 Medicine Lodge is the gateway to the Gyp Hills. 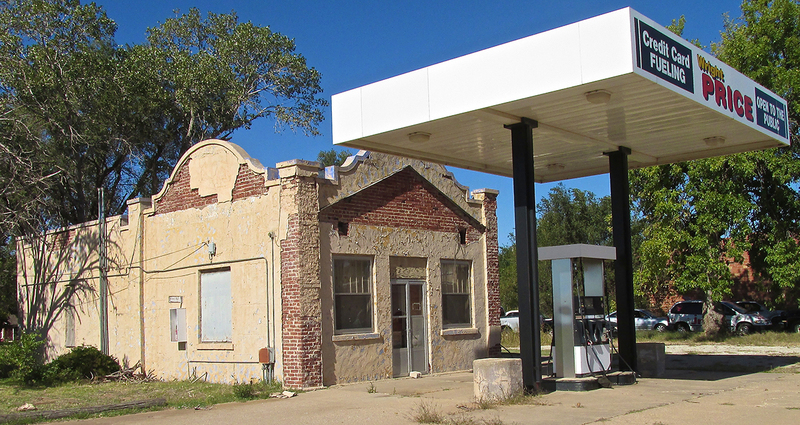 It makes you feel like you’ve suddenly been transported to another part of the country and back in time! The buttes, the valleys, boxed canyon, and very few buildings of any kind! The hills go over into Comanche County, and N/S almost as long as Barber County itself. Thanks for the tip. I will do that in the future. This Winter I made improvements to my range capability and may be able to get out that far without re-fueling. I look forward to seeing these things. 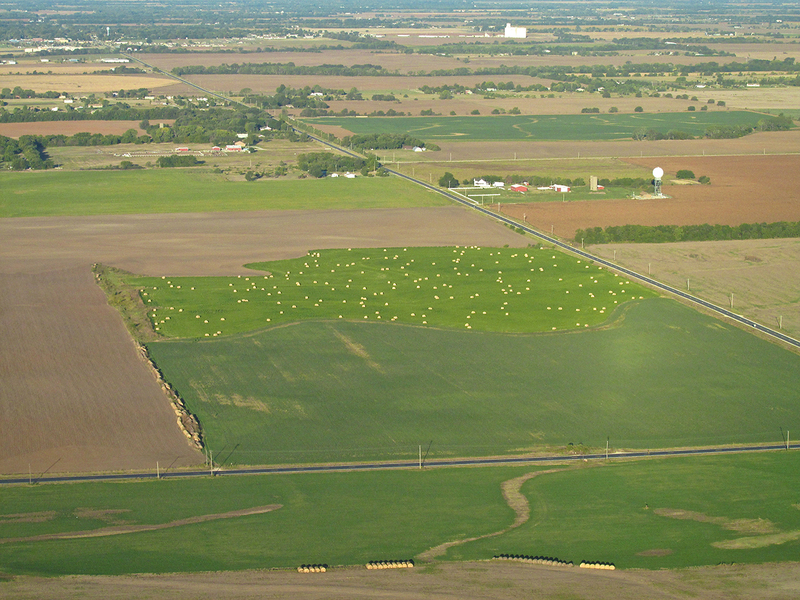 If you check my flight to Waynoka, Oklahoma, I was on the edge of some territory such as you speak. 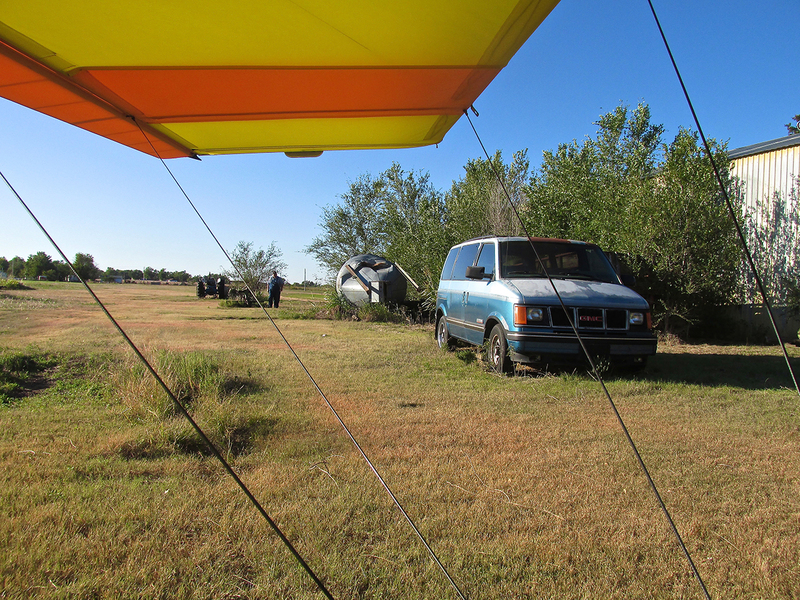 I also made a flight to Medicine Lodge a while back that was entering that territory. Both of those flights were at the edge of my main fuel tank range. Soon I will be going farther.